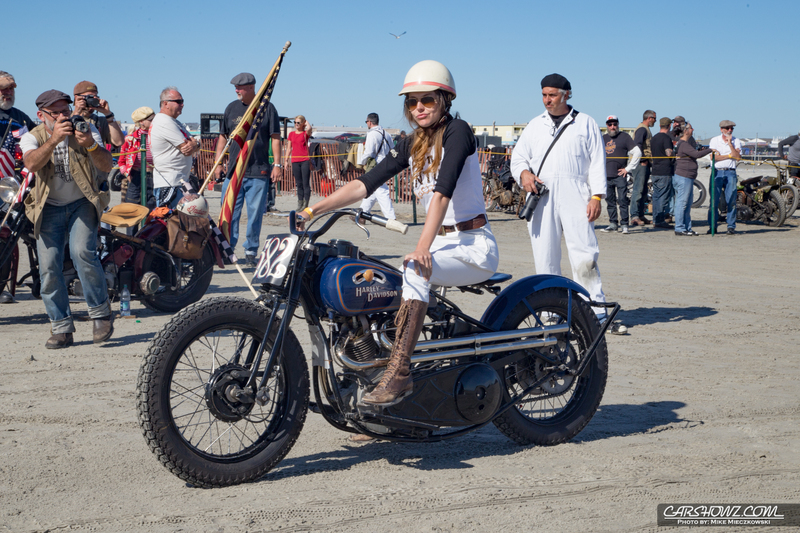 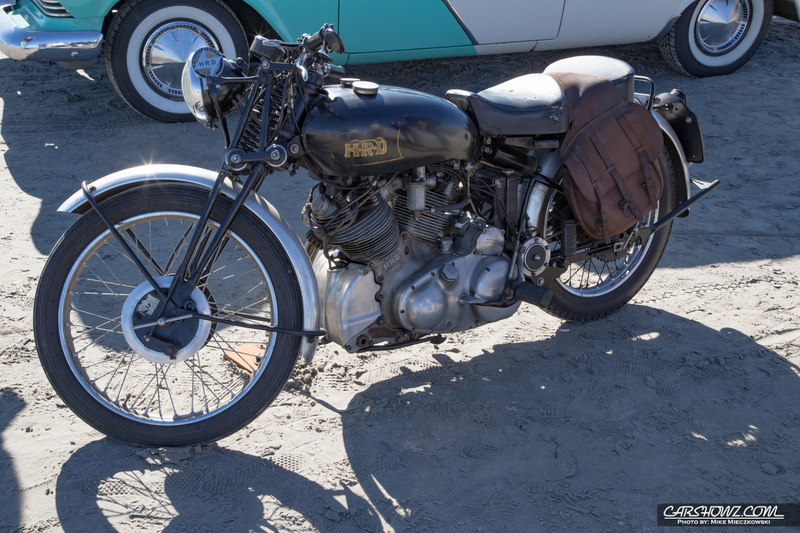 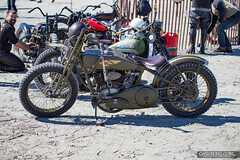 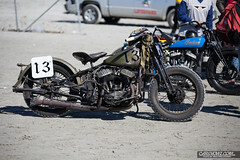 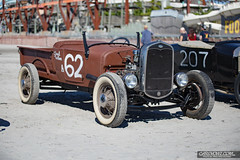 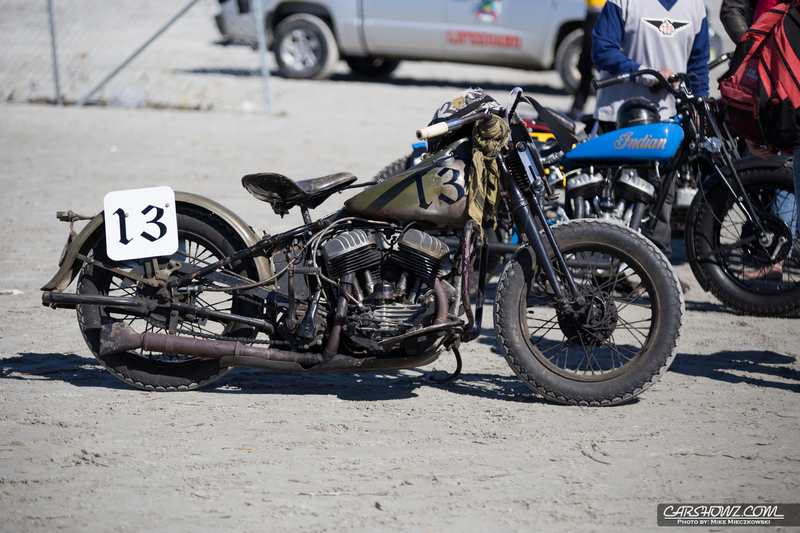 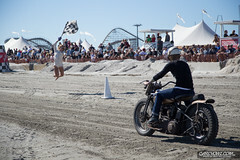 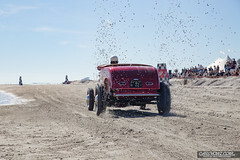 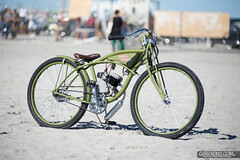 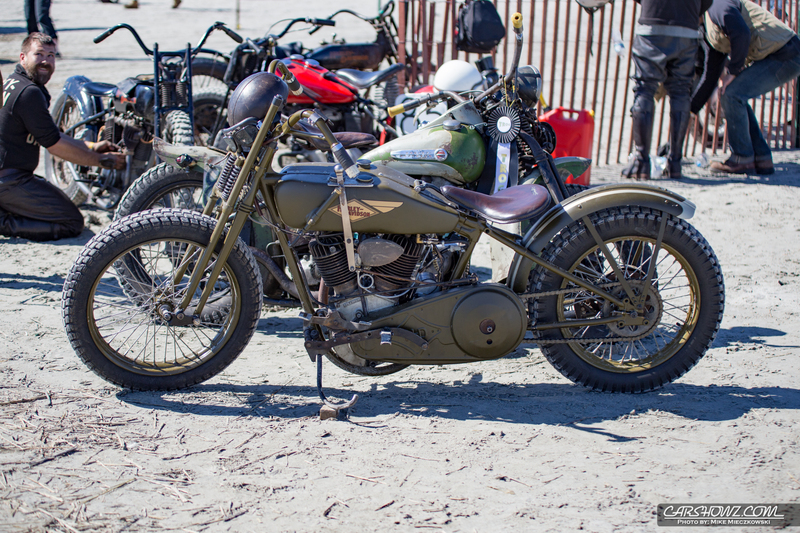 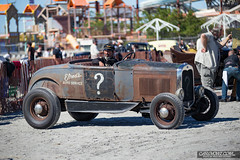 The 4th Annual Oilers CC/MC Race of Gentlemen may have started a week later than scheduled but, it was well worth it. 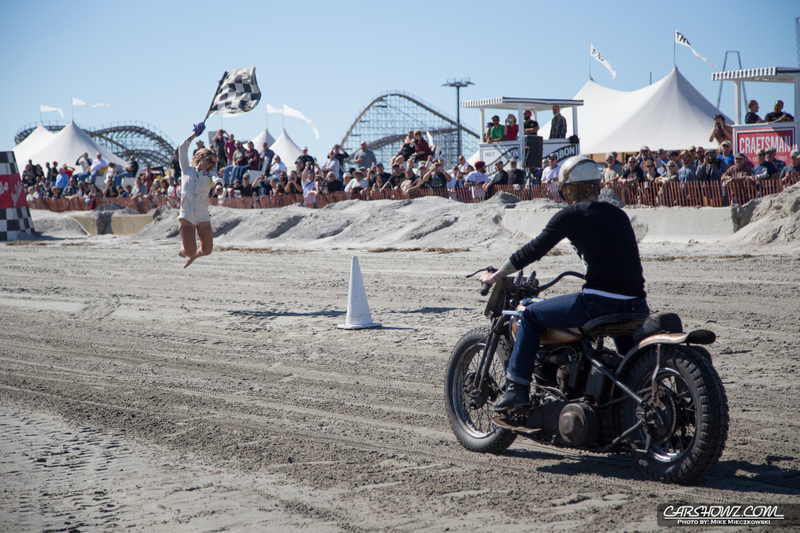 A must see racing event for sure. 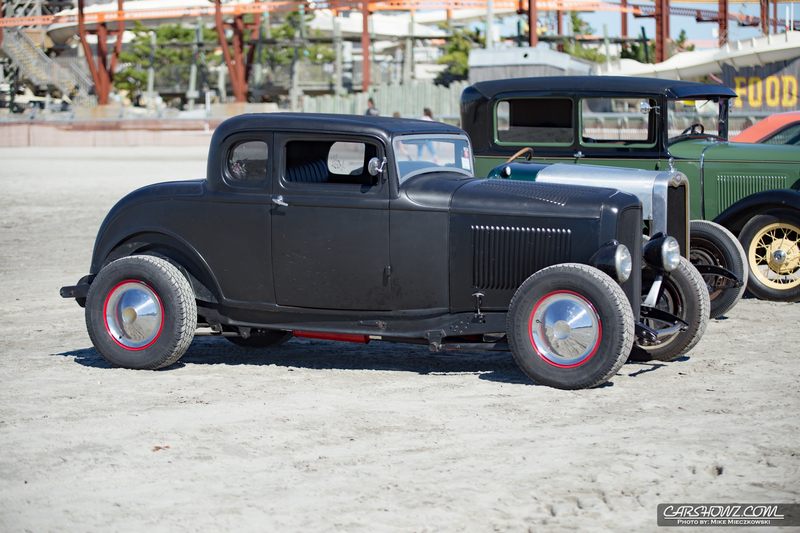 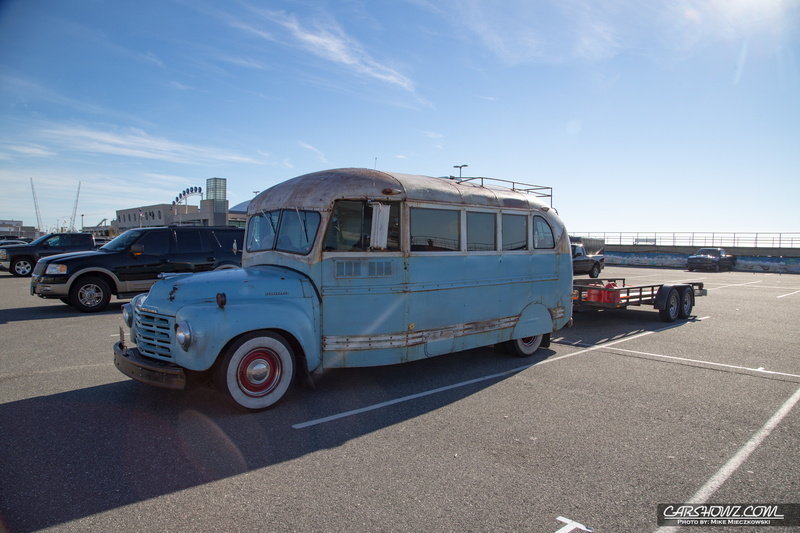 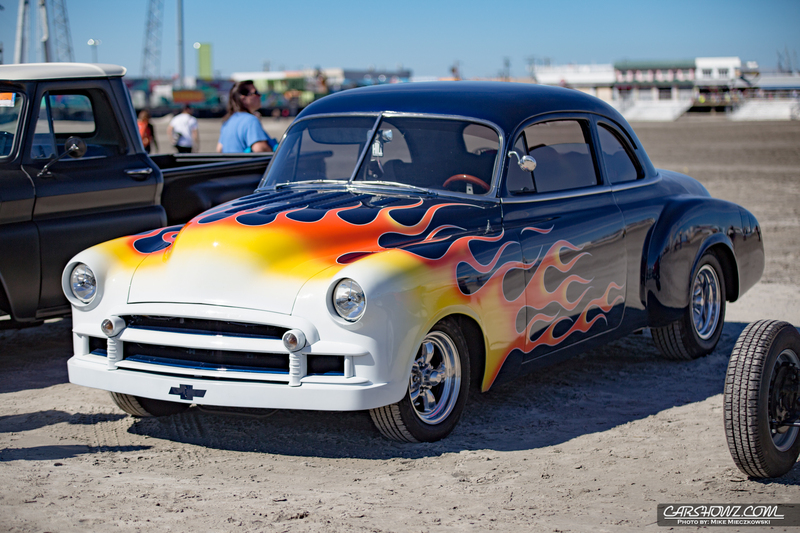 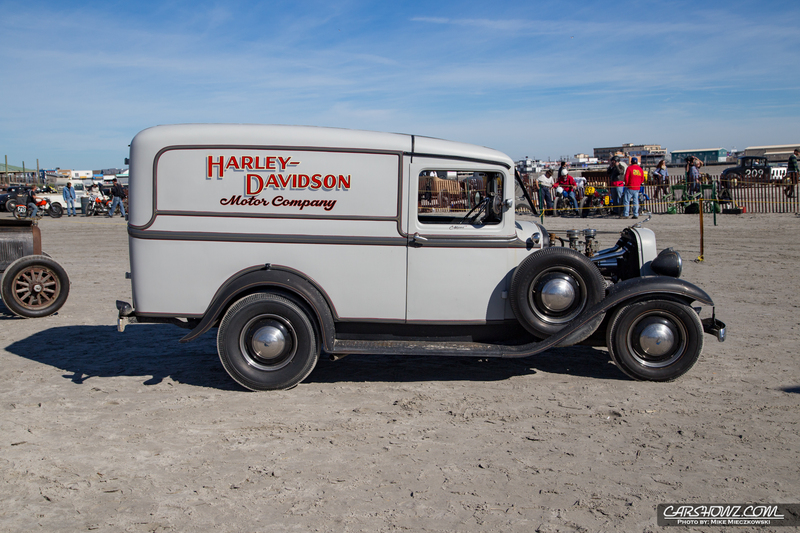 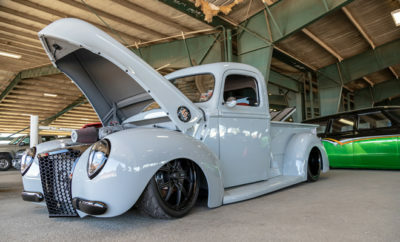 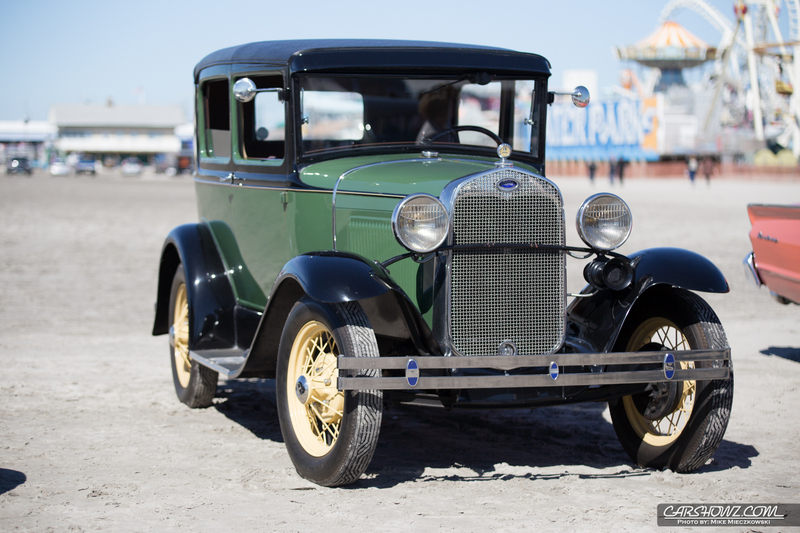 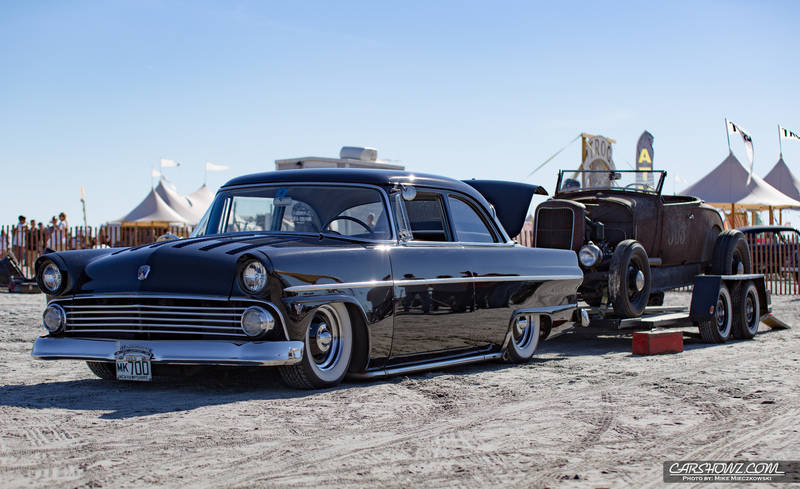 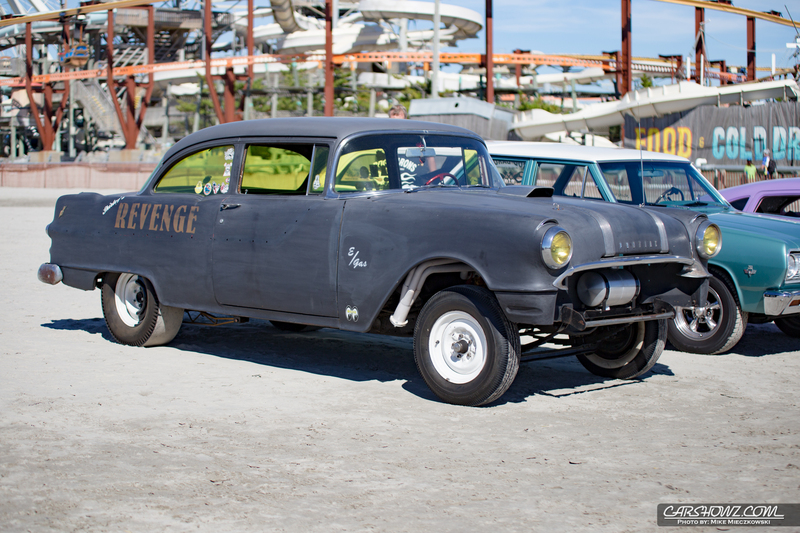 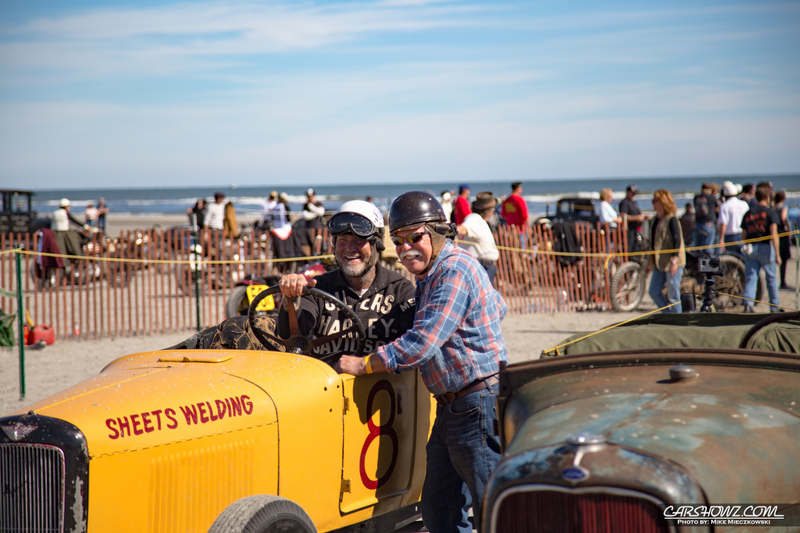 If you are a fan of Pre-War cars, trucks and bikes then this is an event for you. 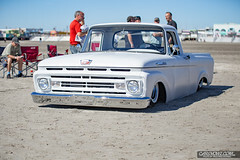 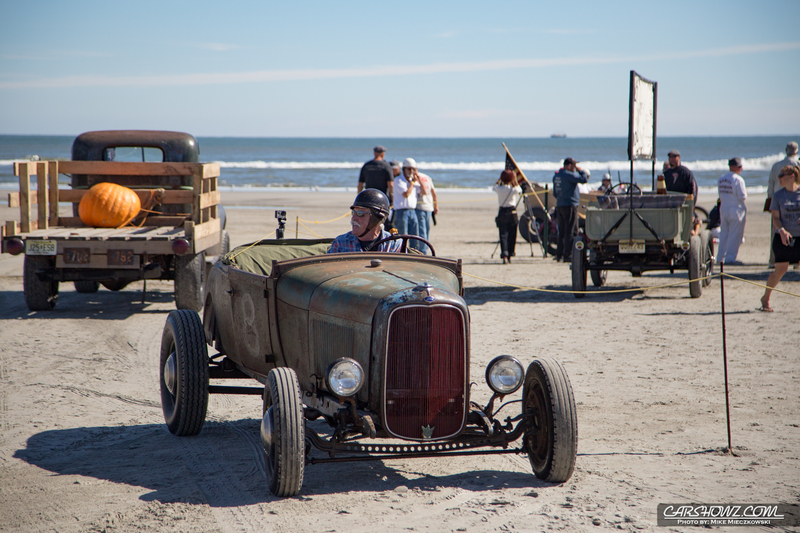 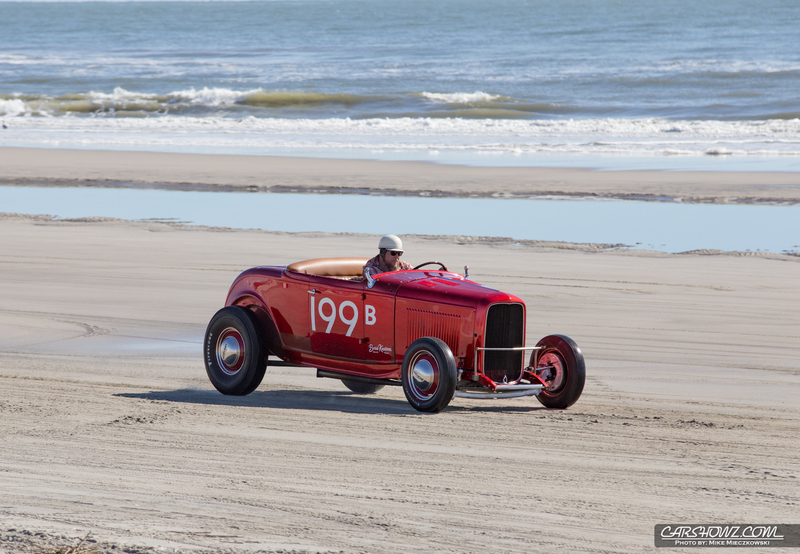 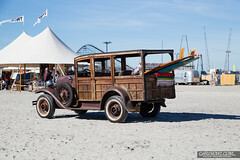 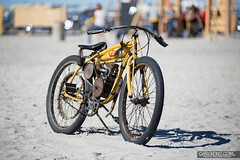 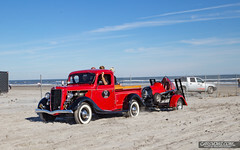 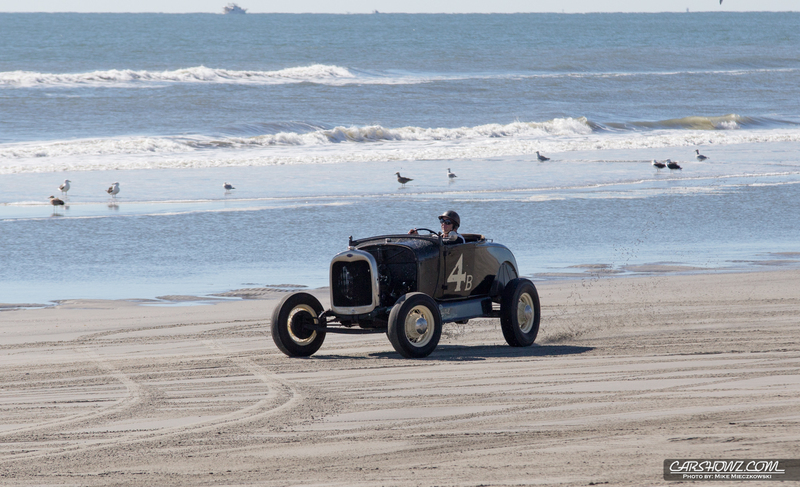 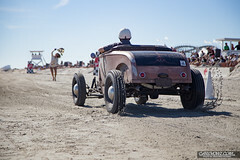 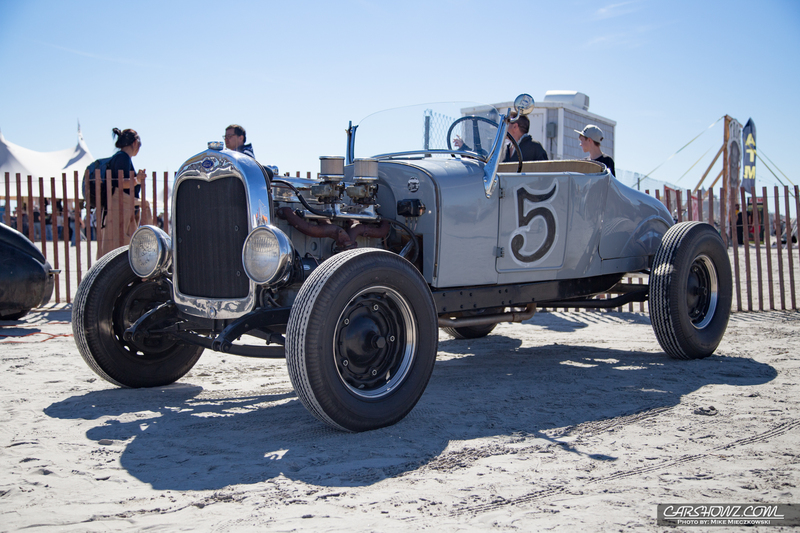 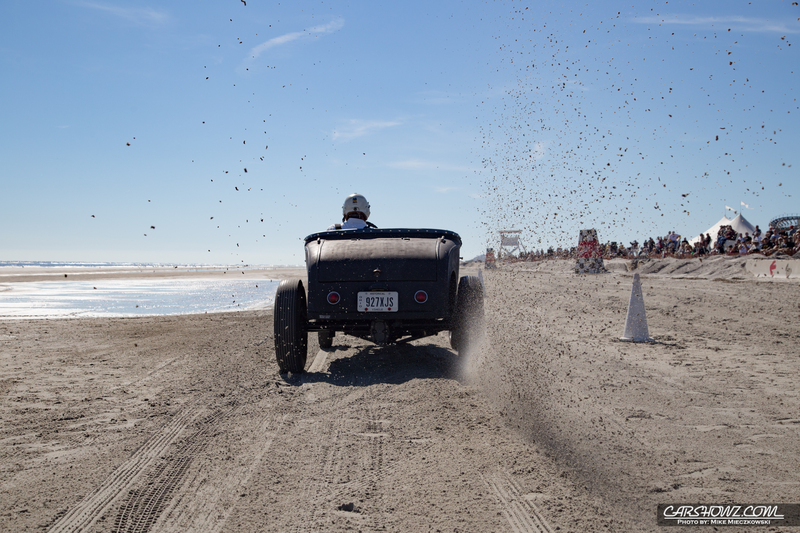 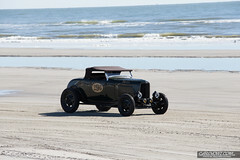 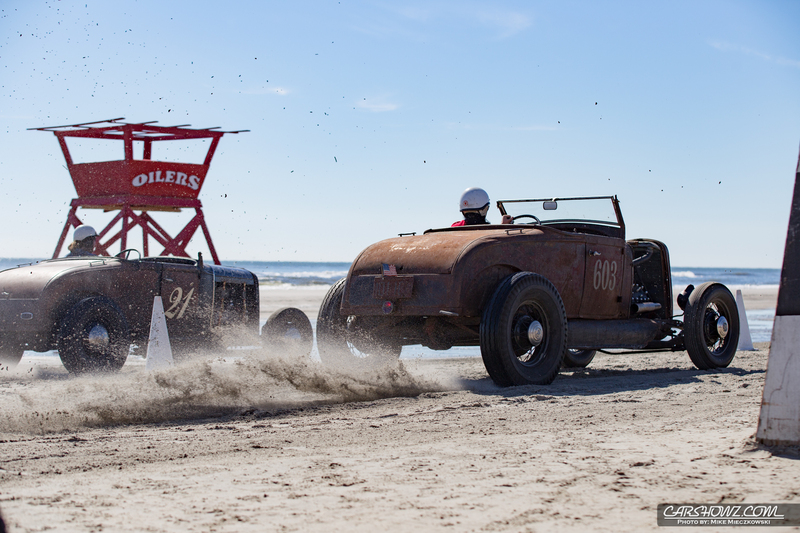 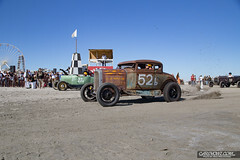 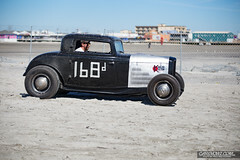 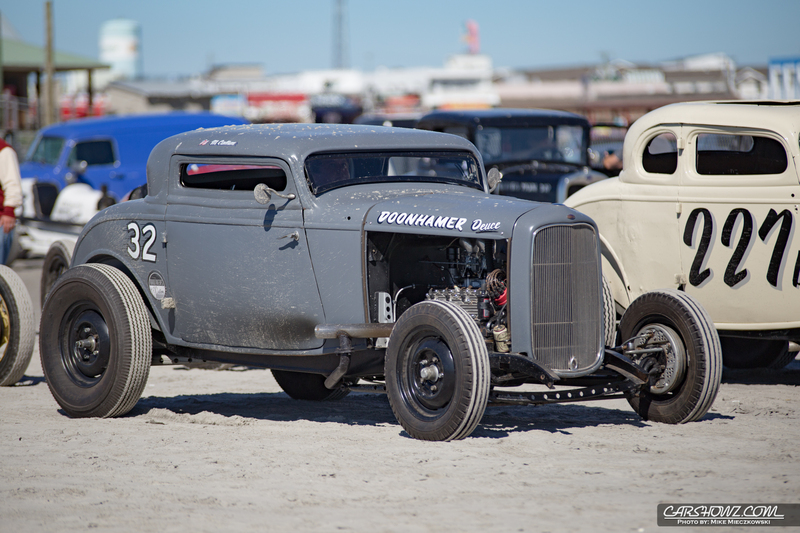 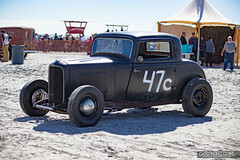 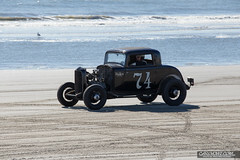 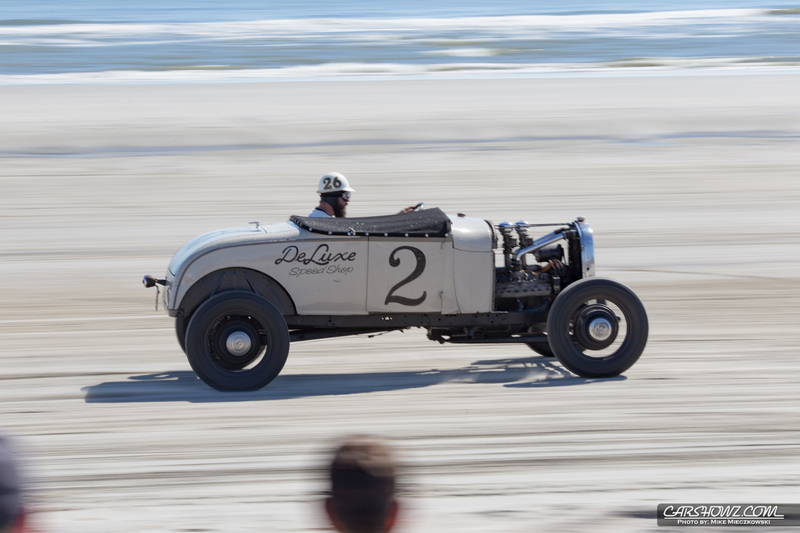 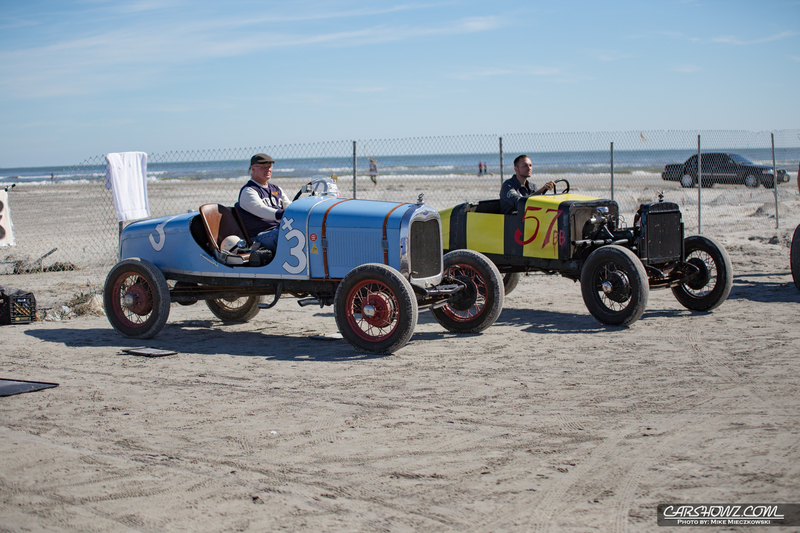 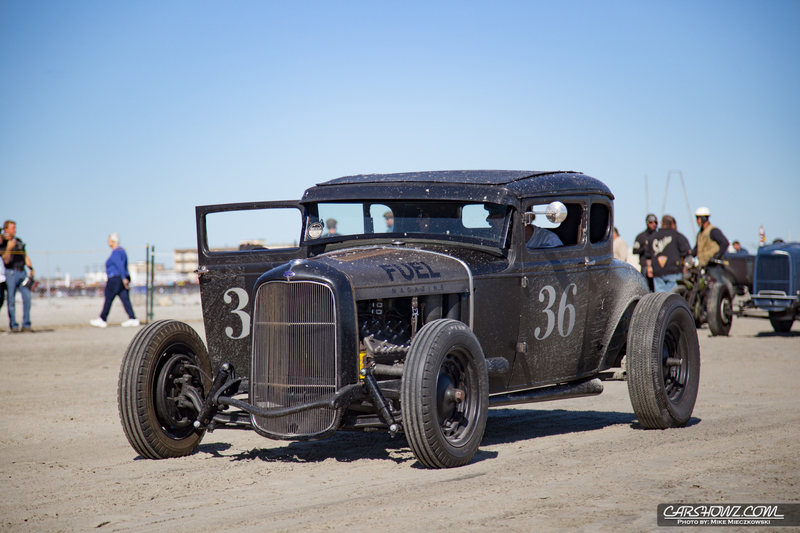 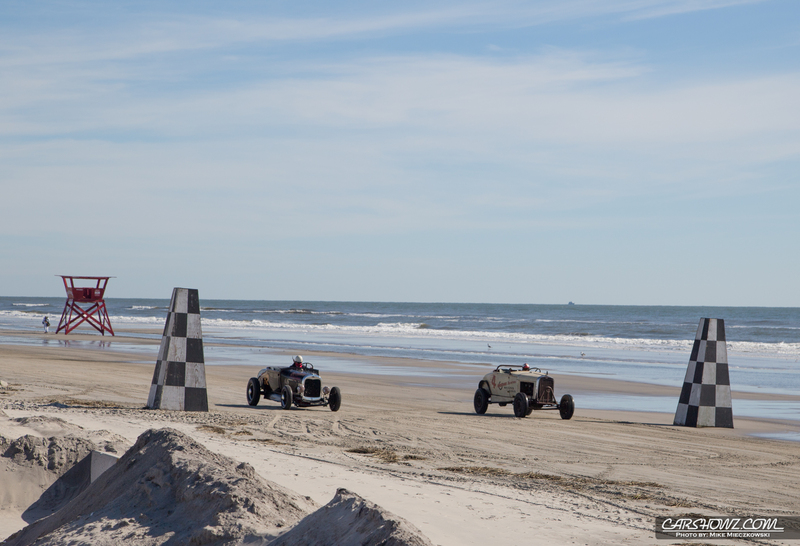 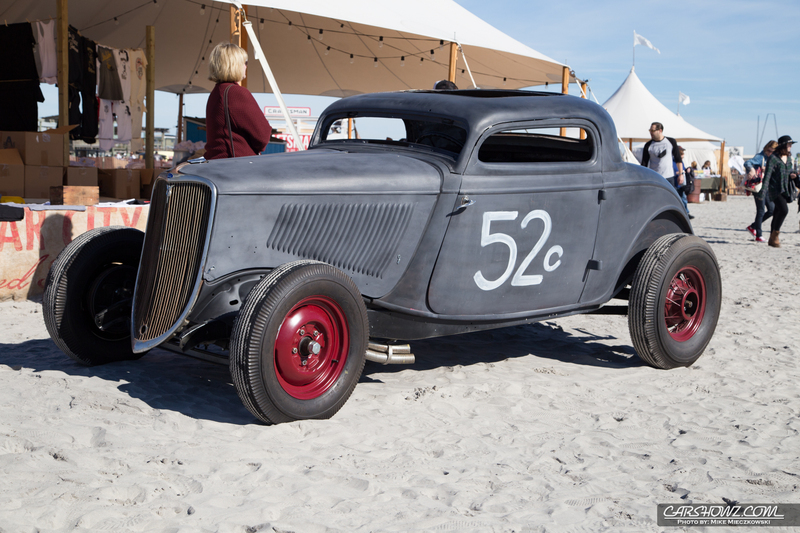 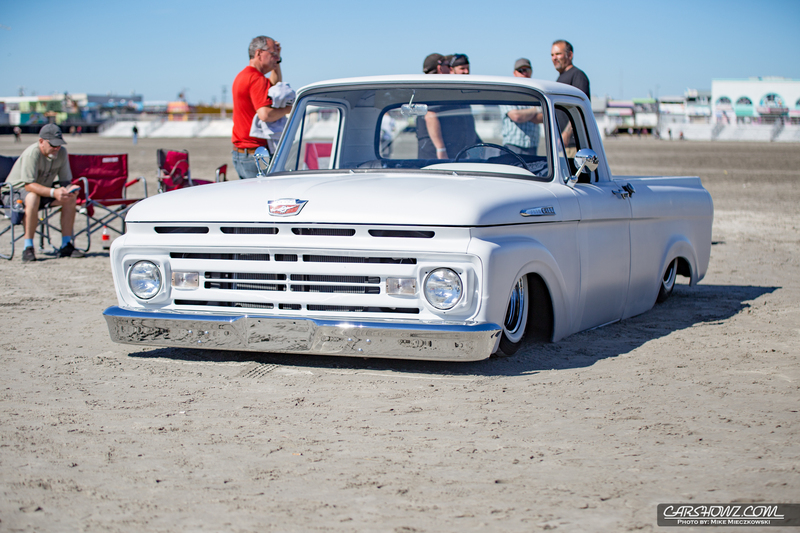 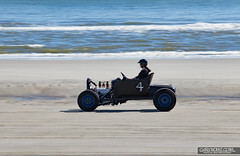 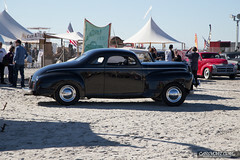 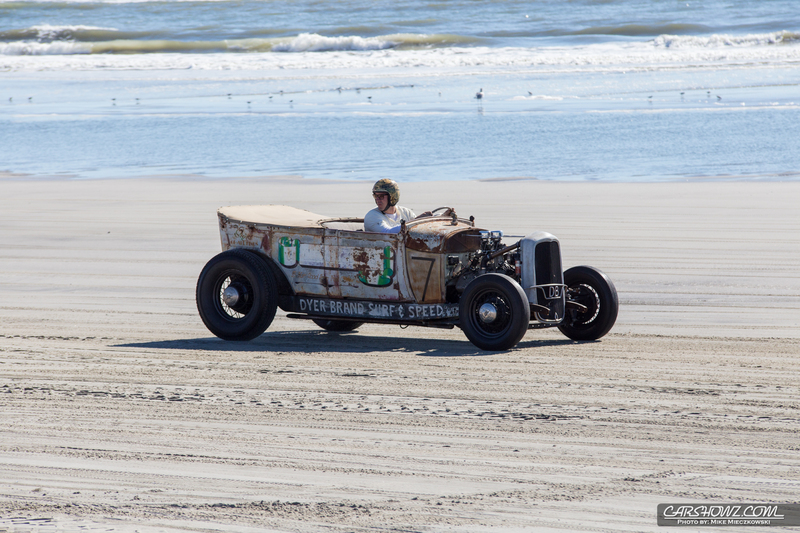 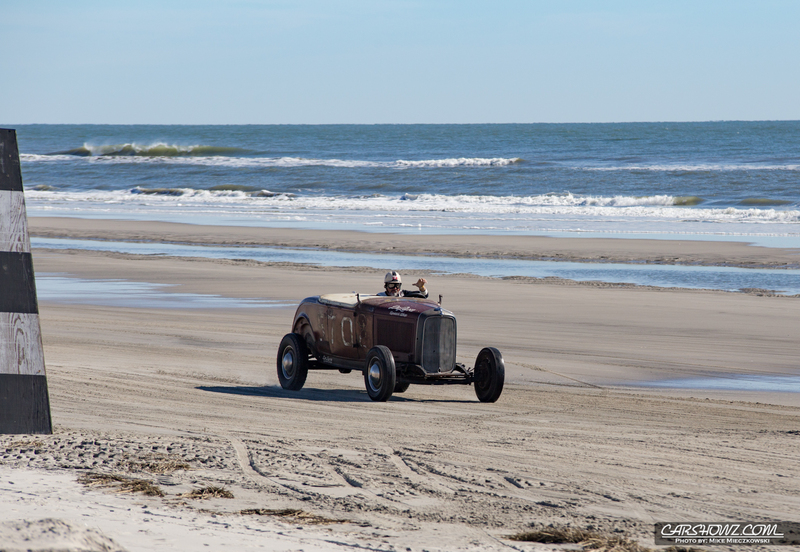 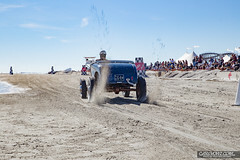 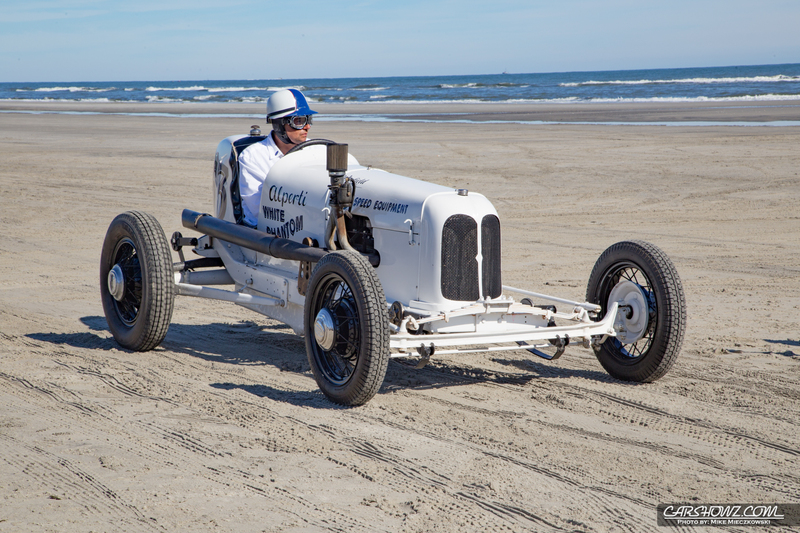 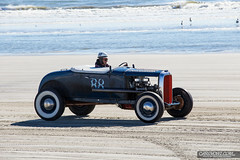 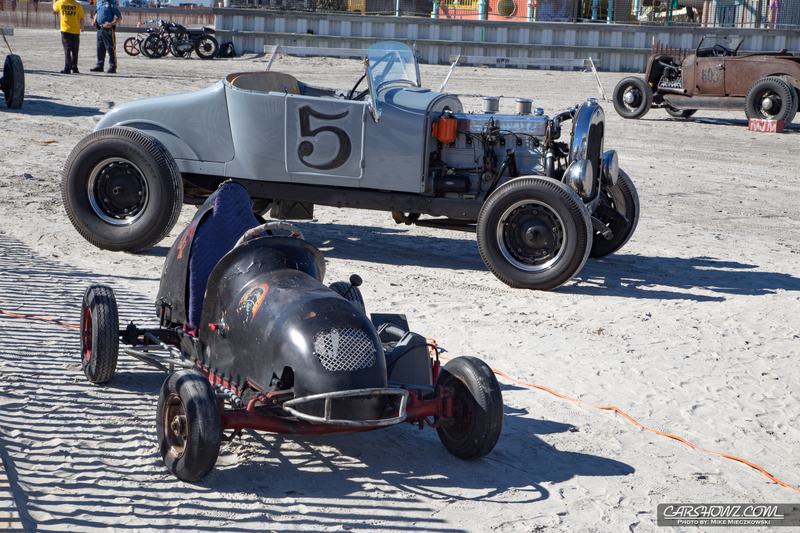 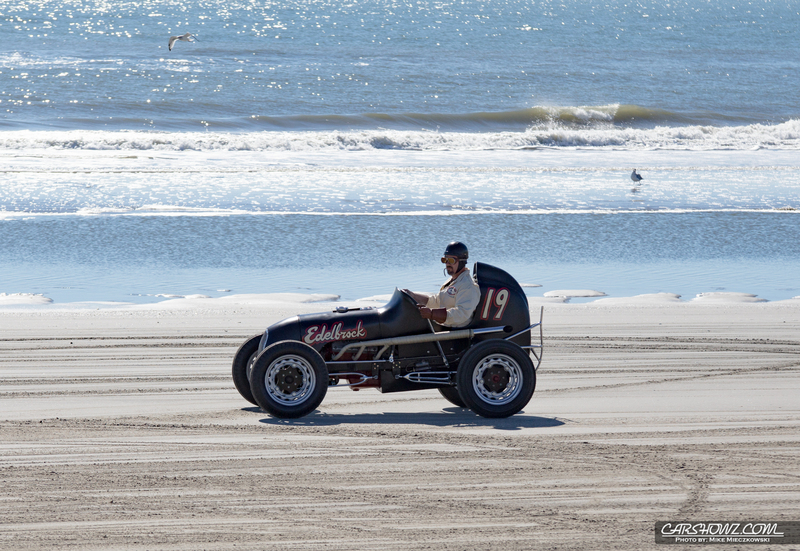 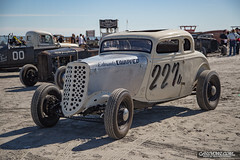 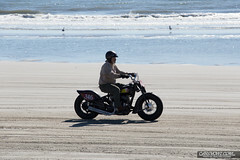 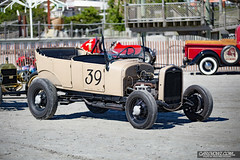 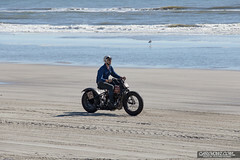 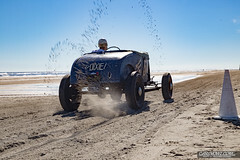 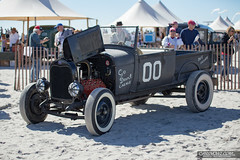 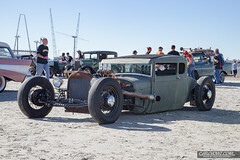 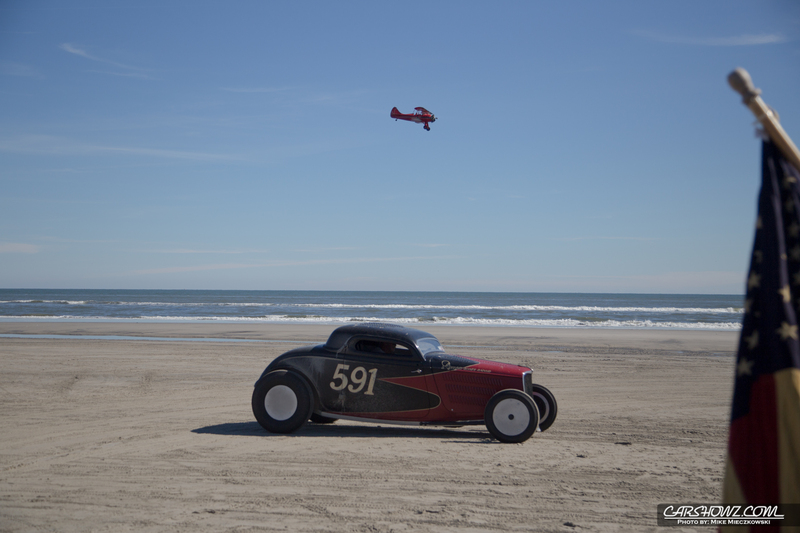 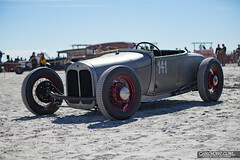 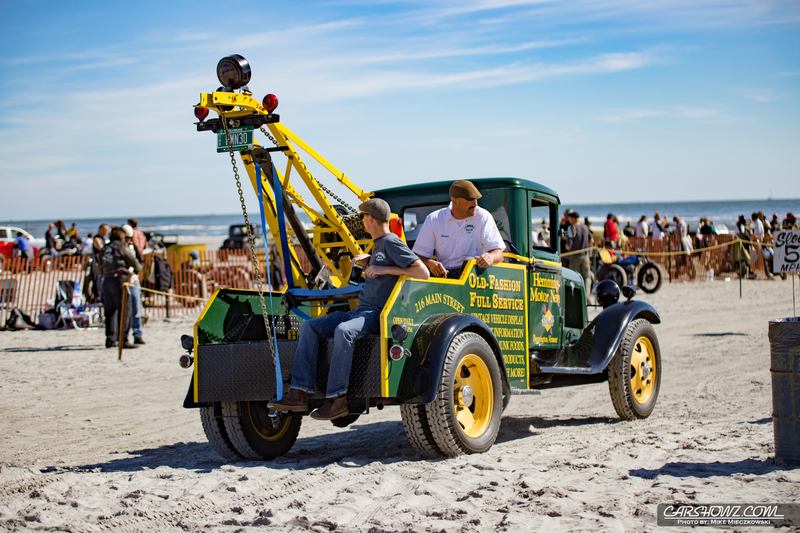 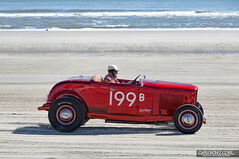 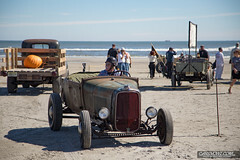 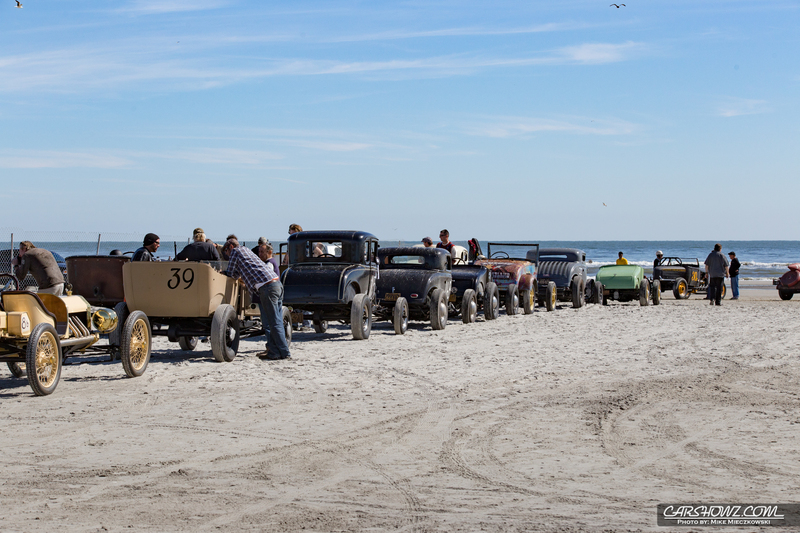 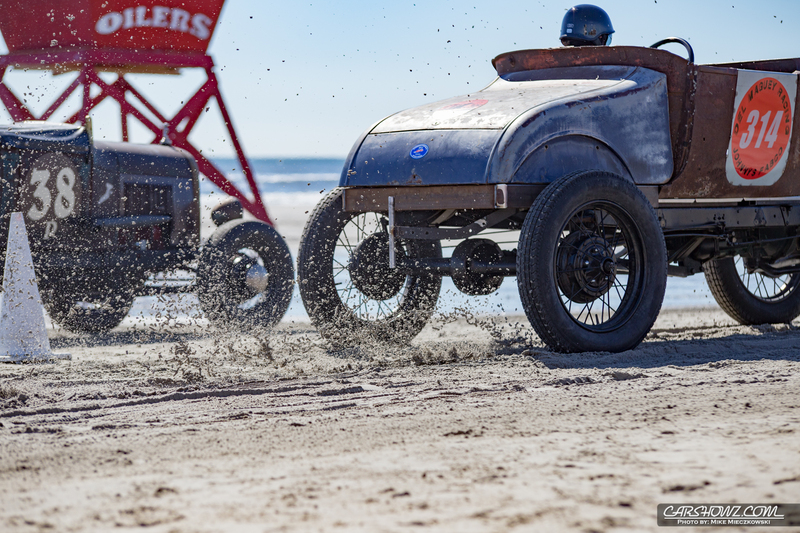 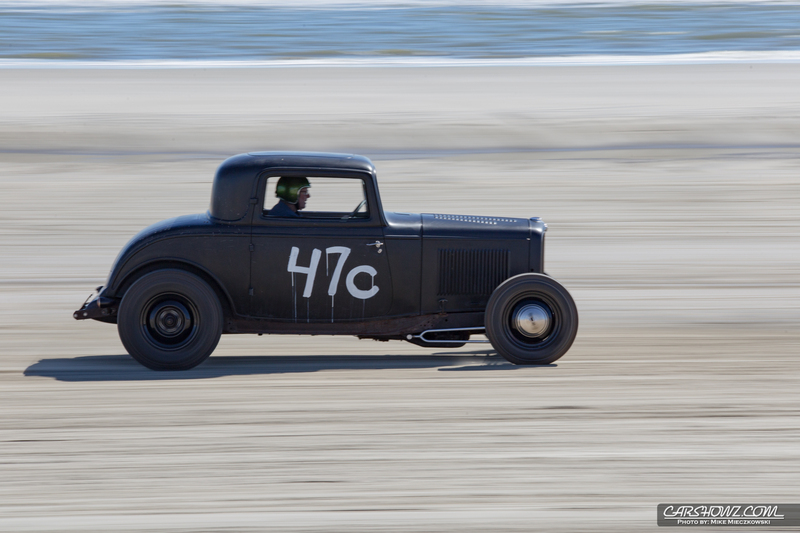 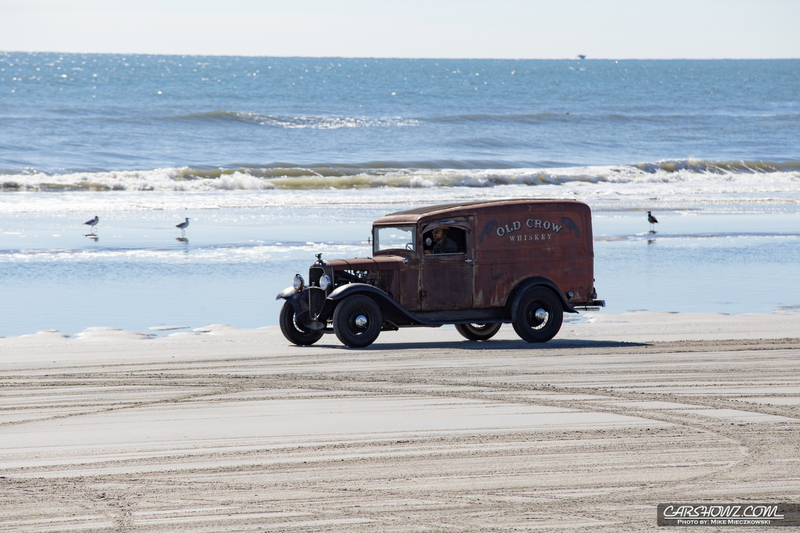 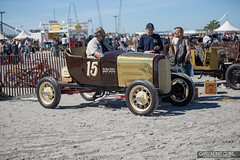 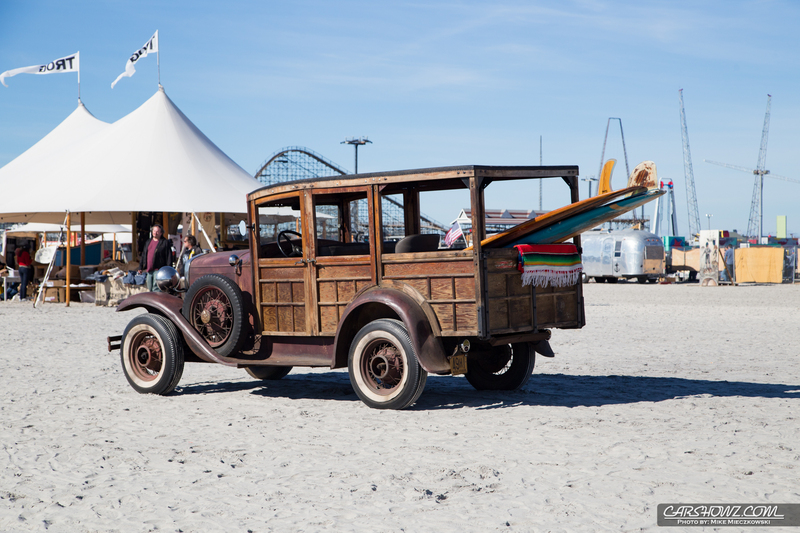 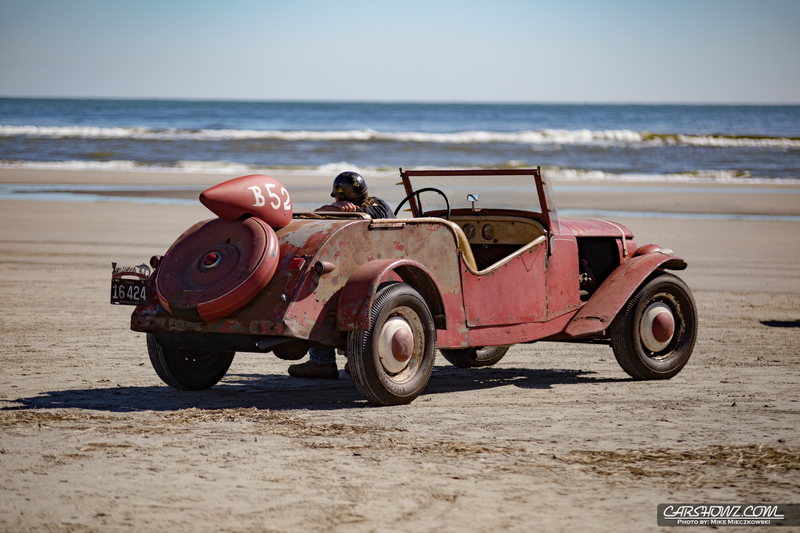 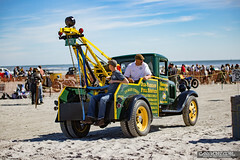 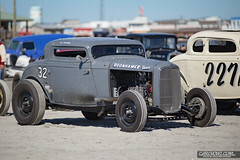 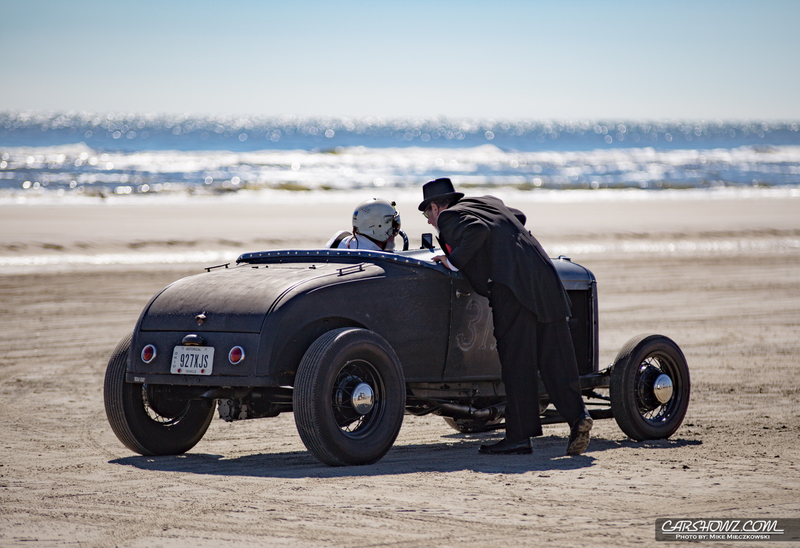 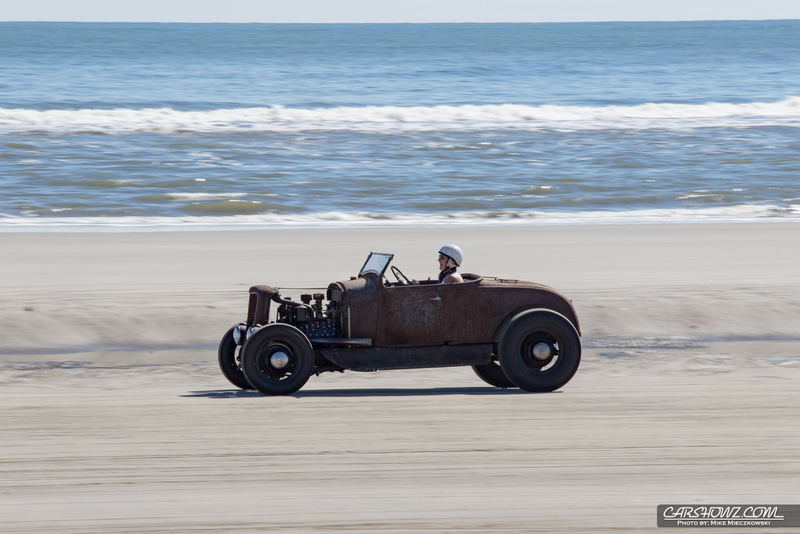 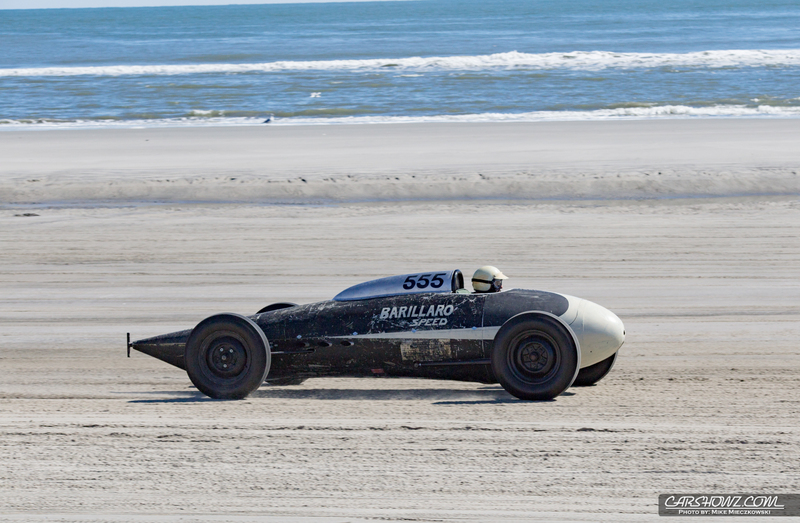 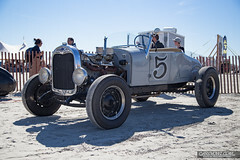 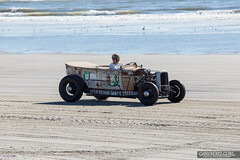 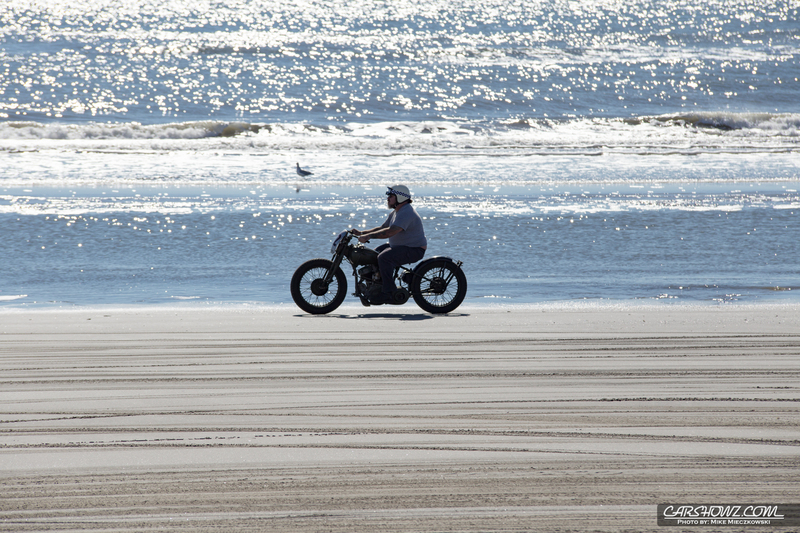 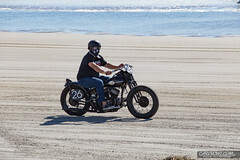 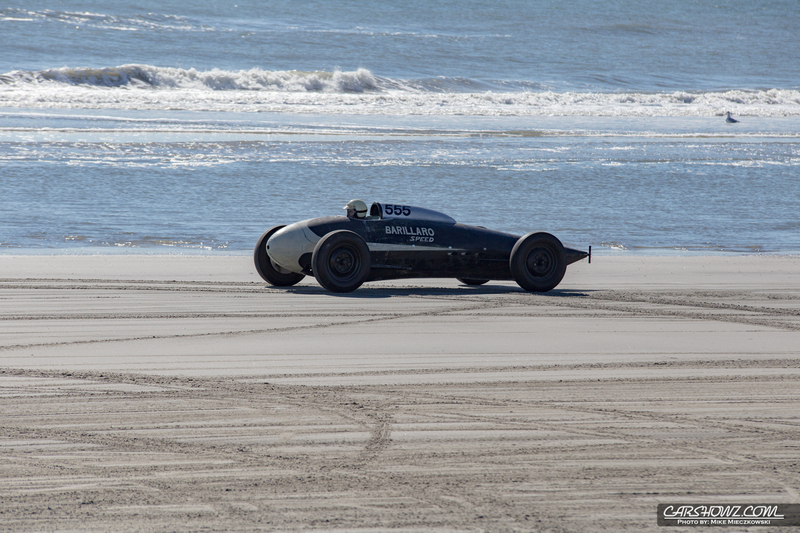 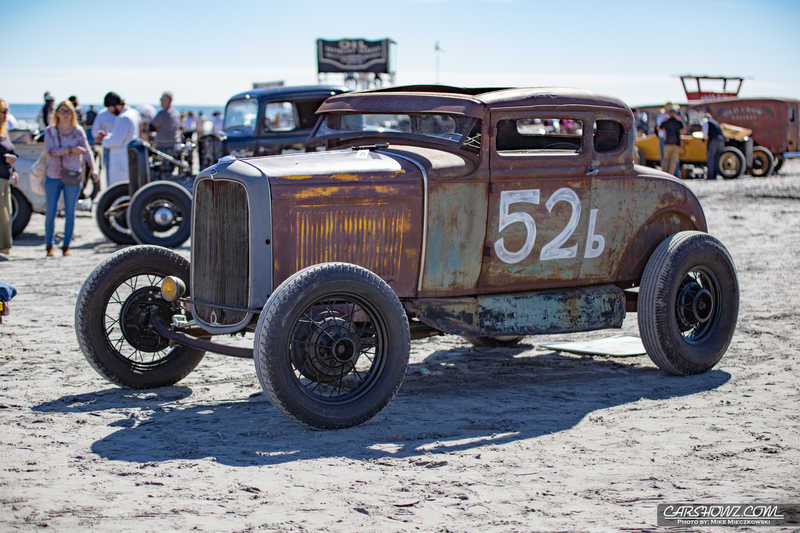 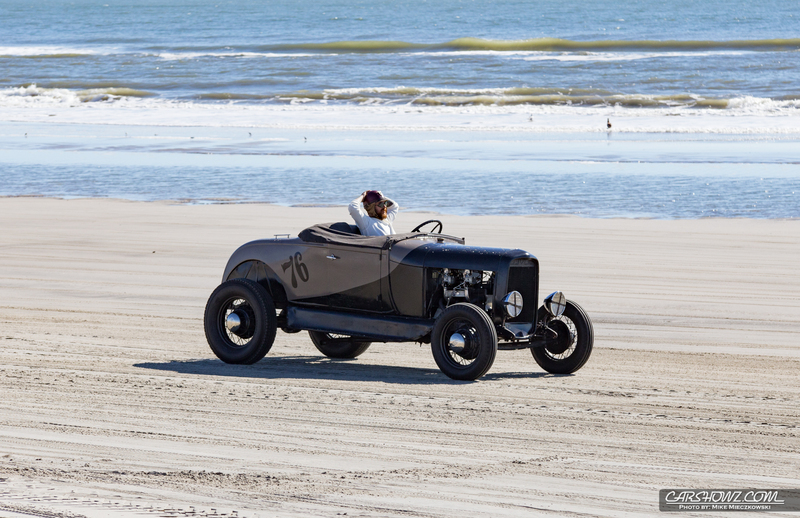 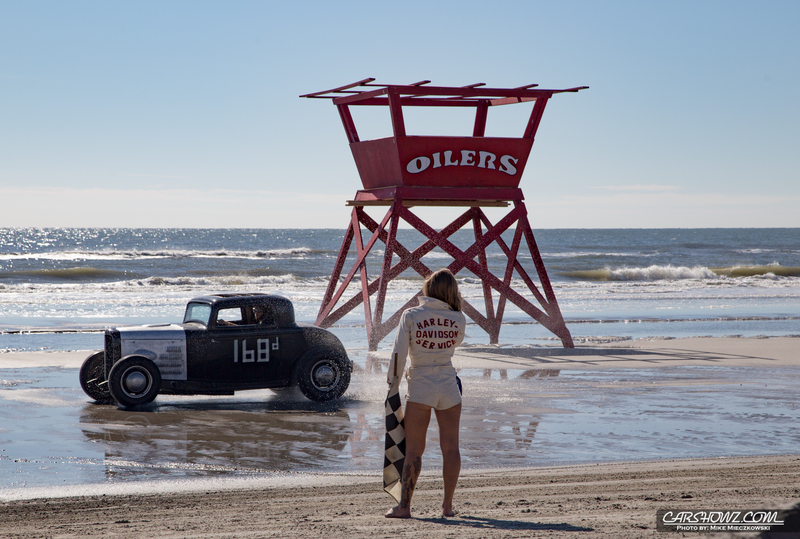 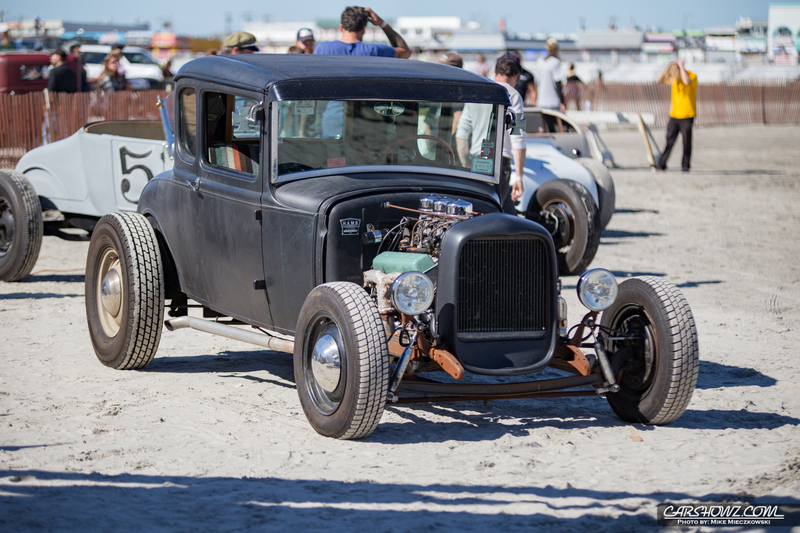 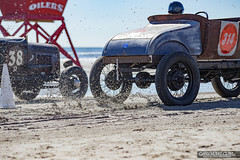 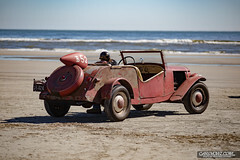 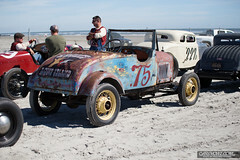 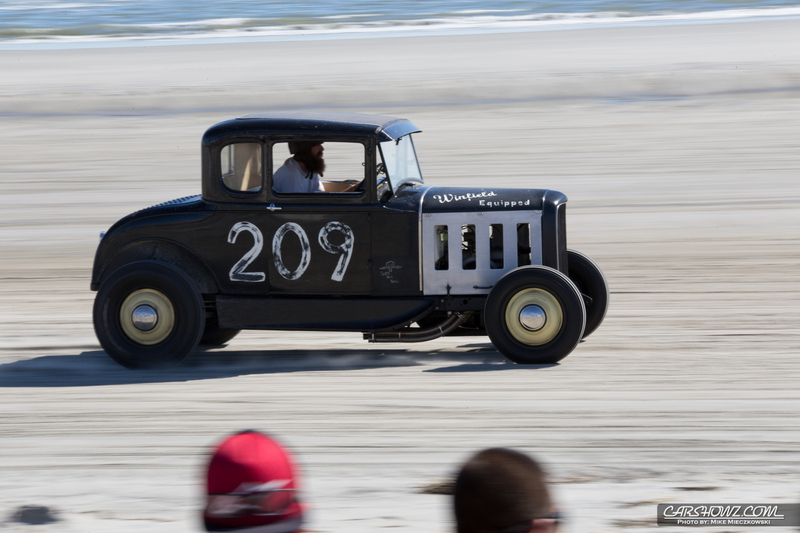 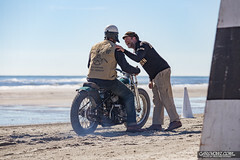 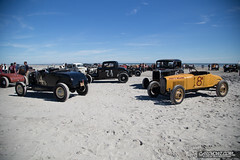 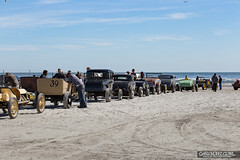 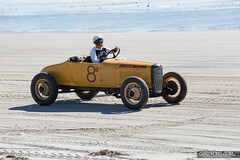 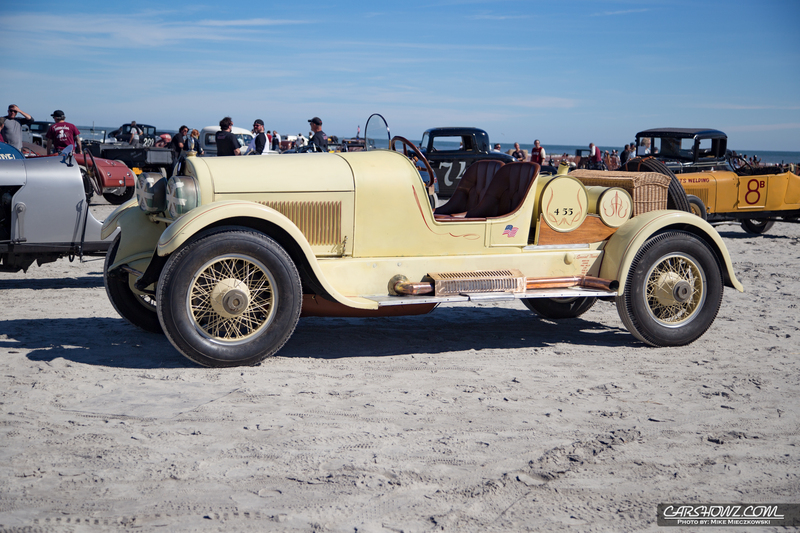 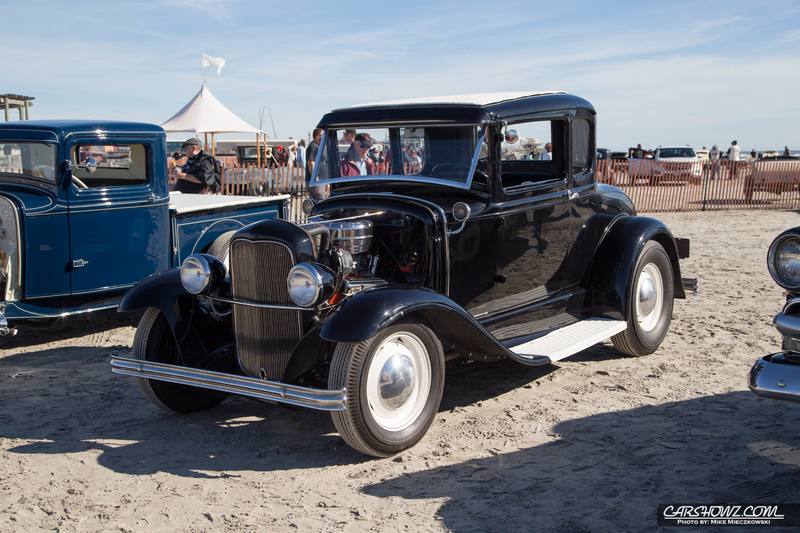 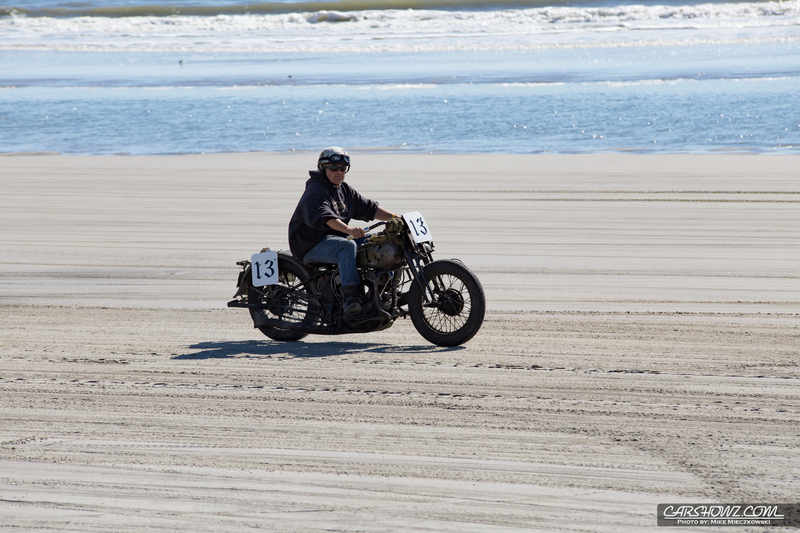 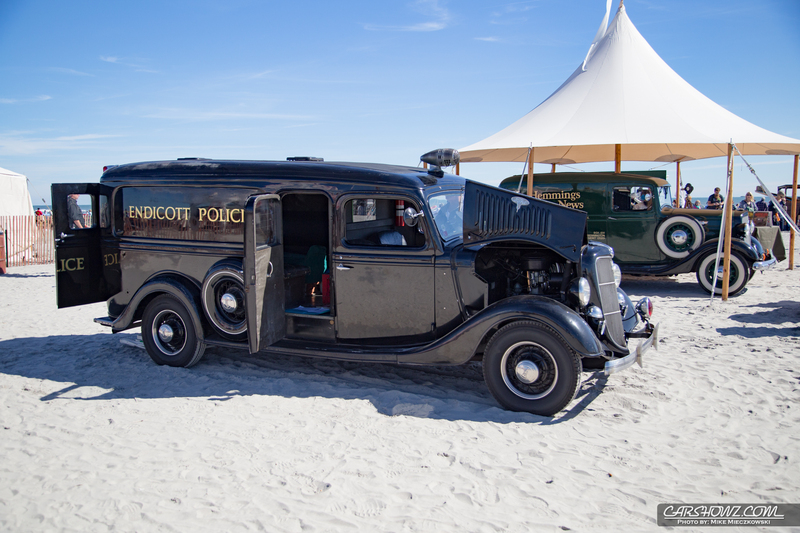 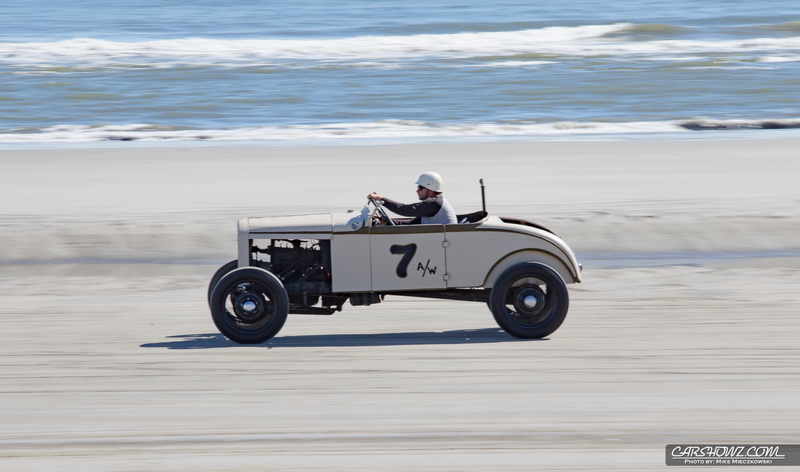 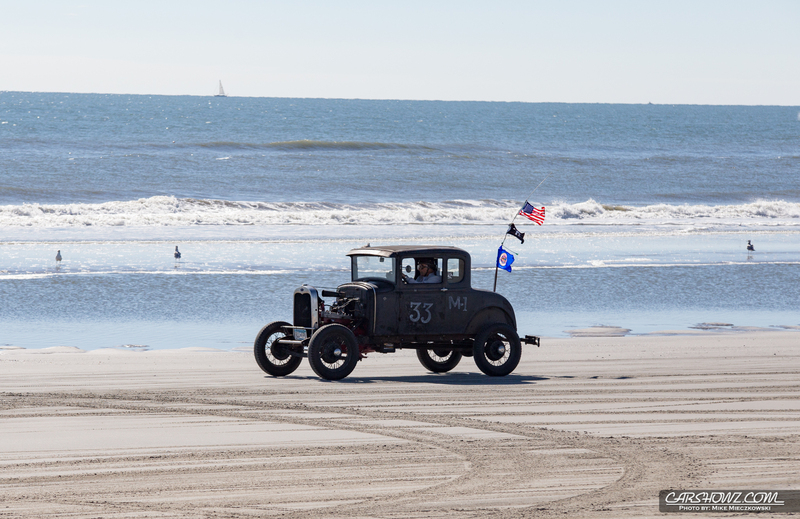 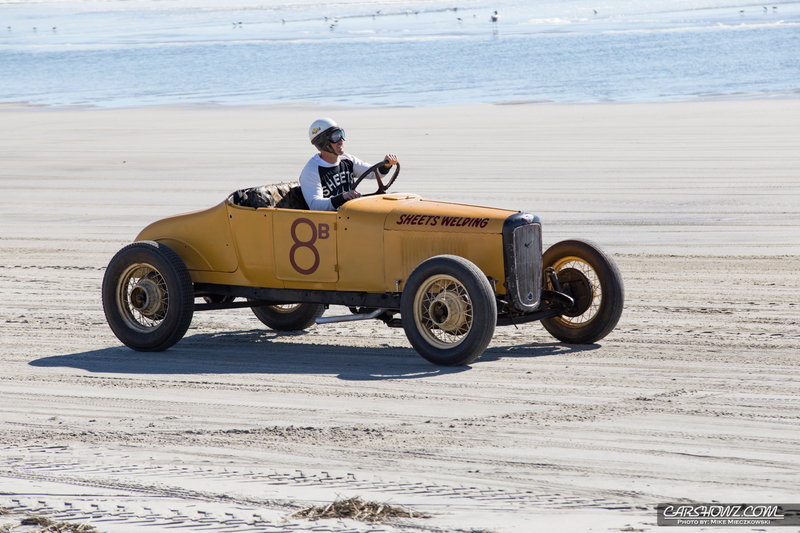 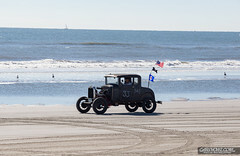 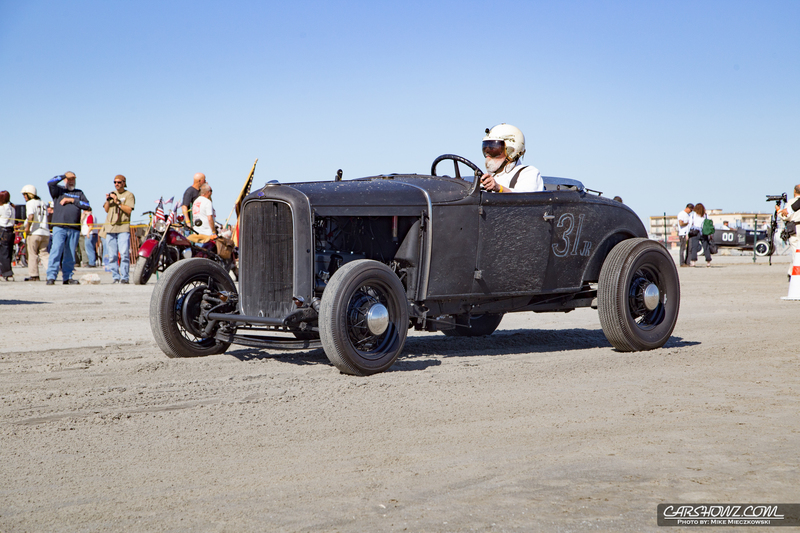 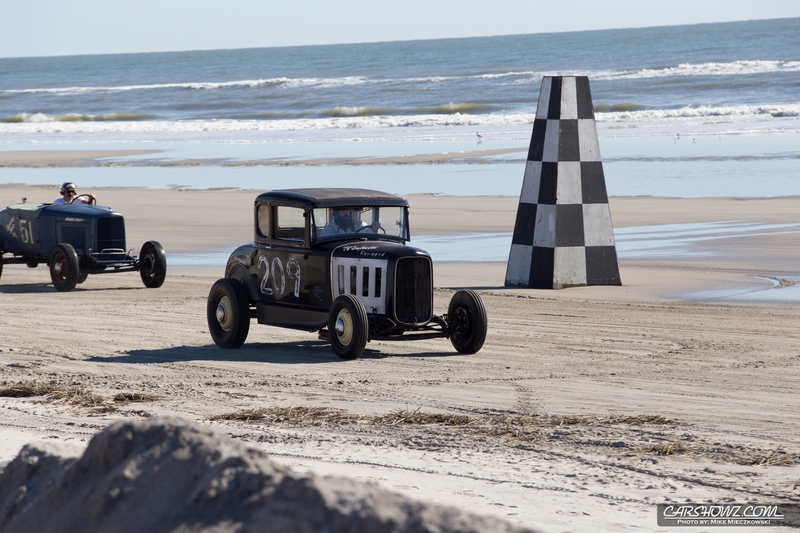 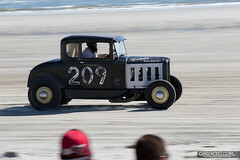 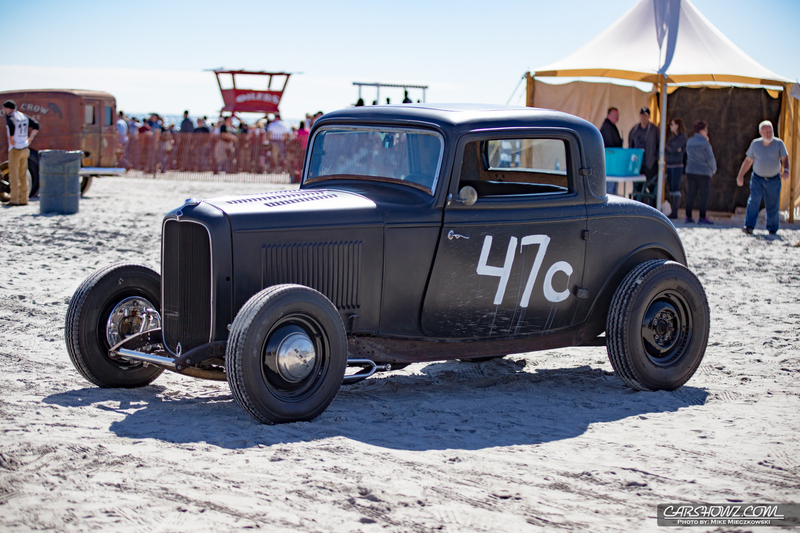 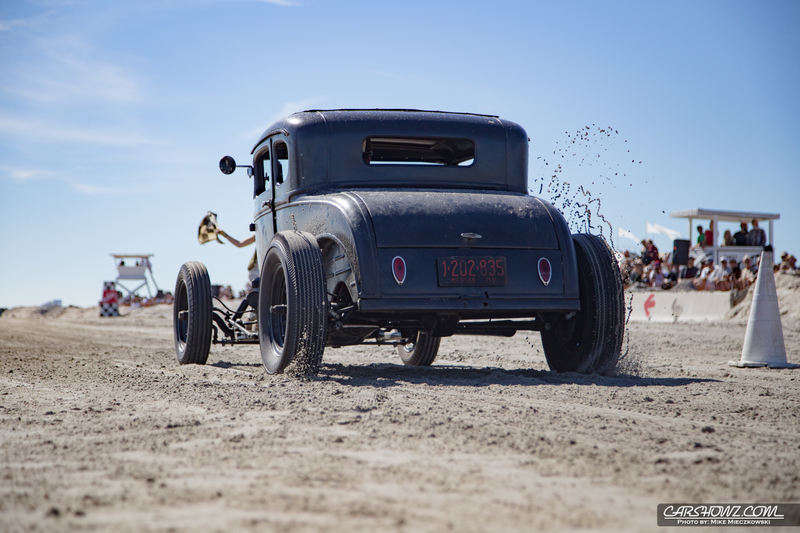 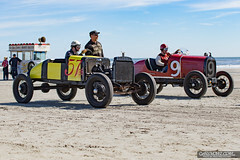 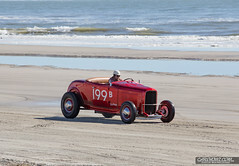 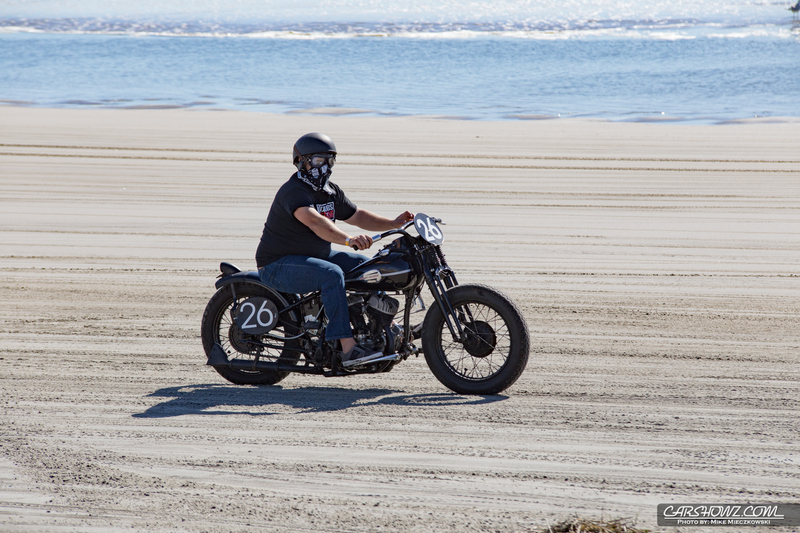 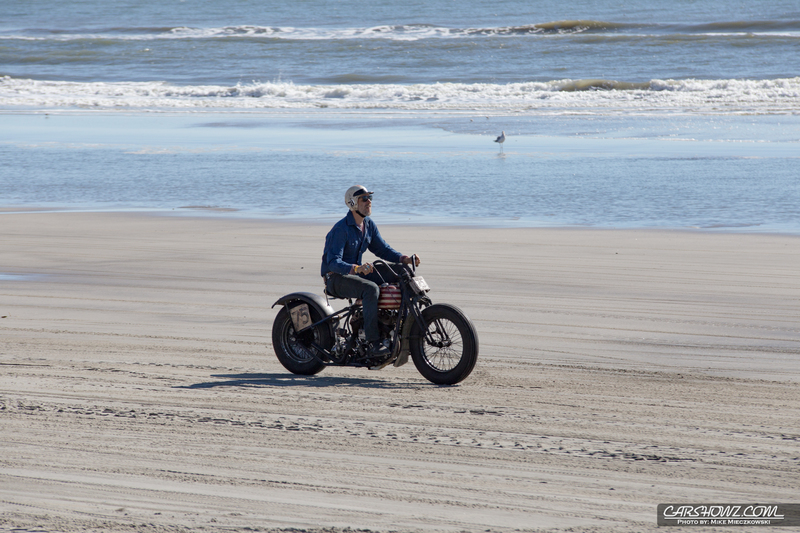 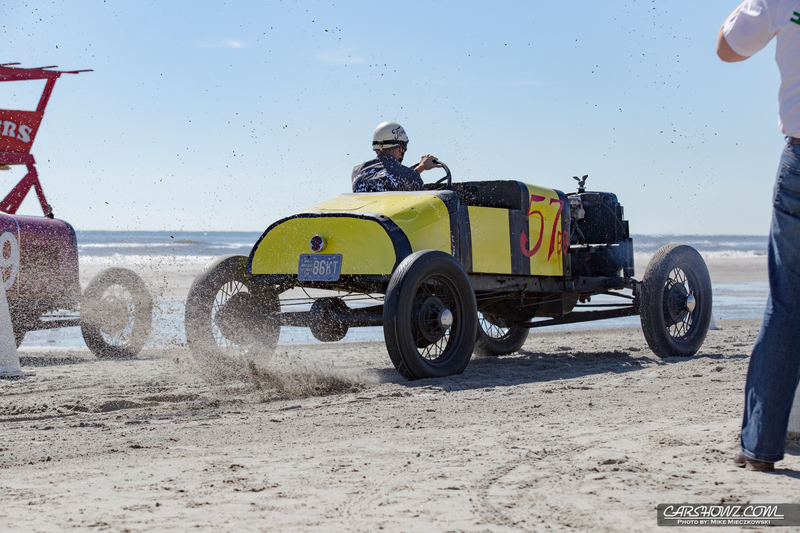 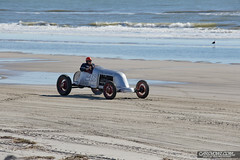 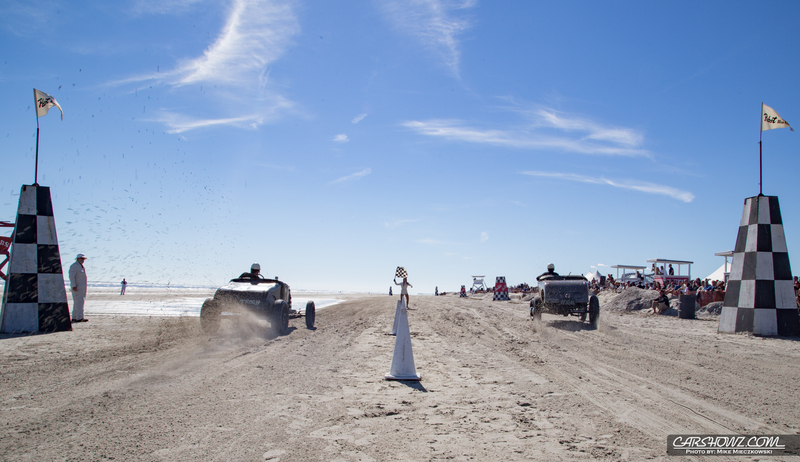 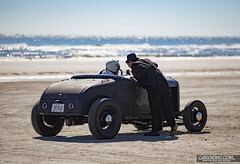 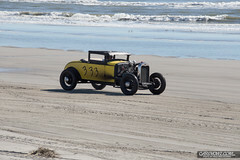 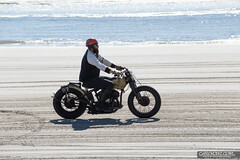 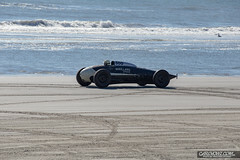 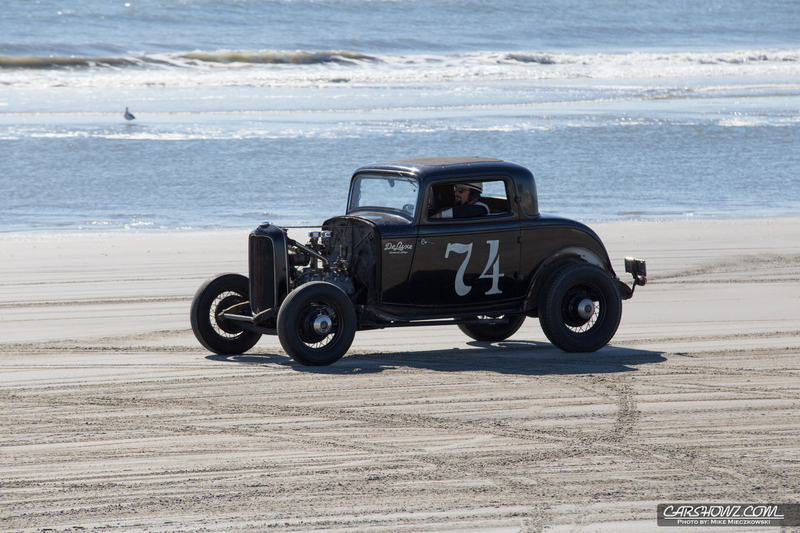 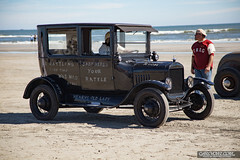 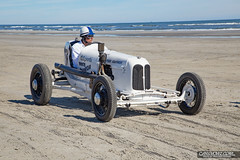 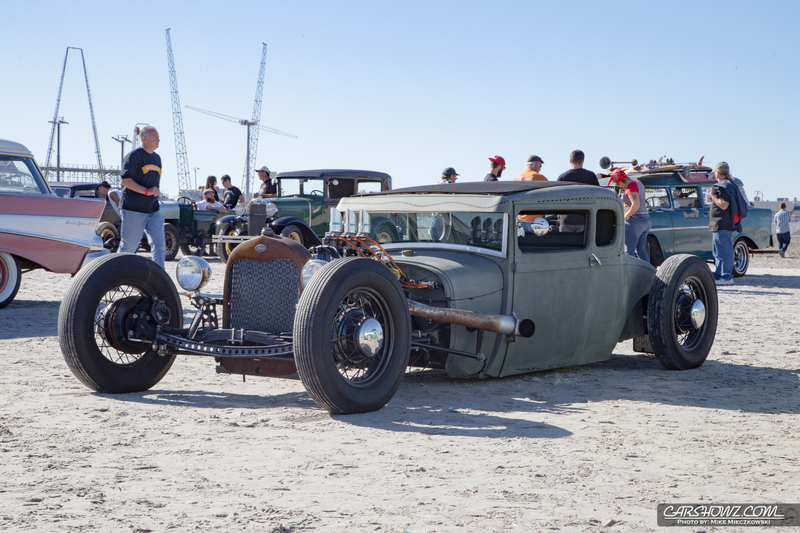 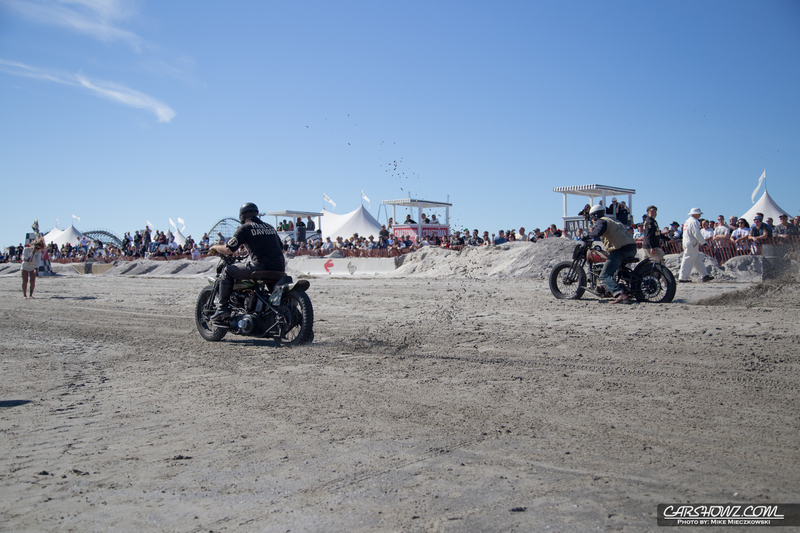 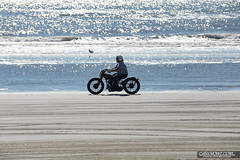 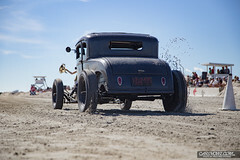 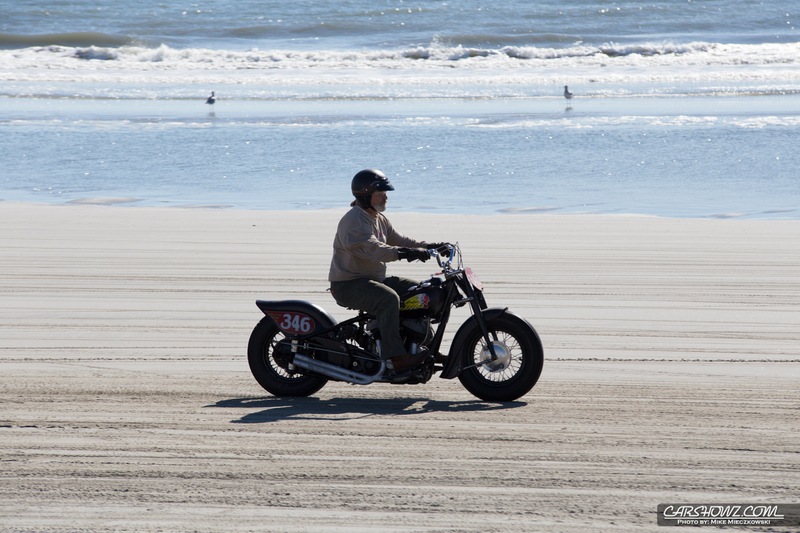 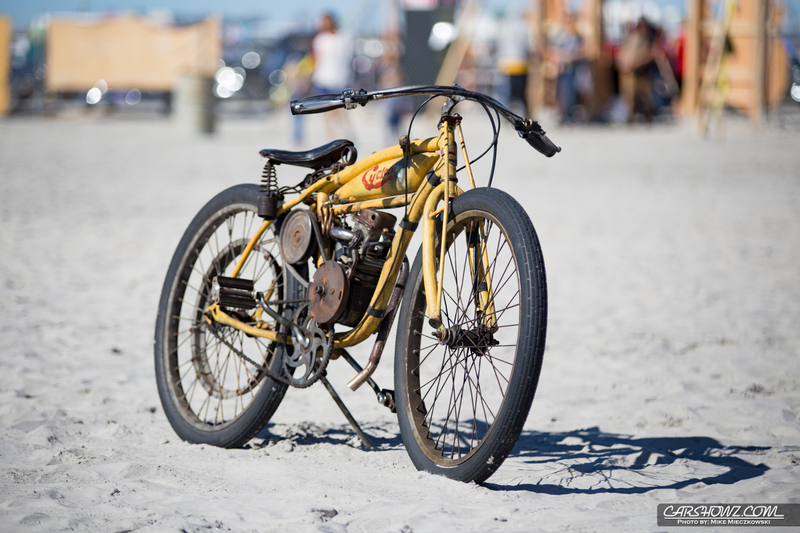 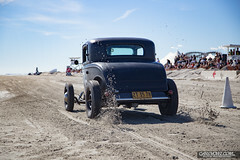 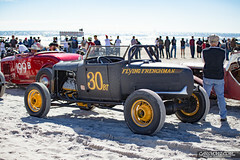 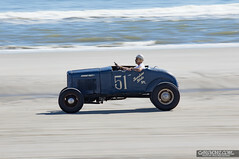 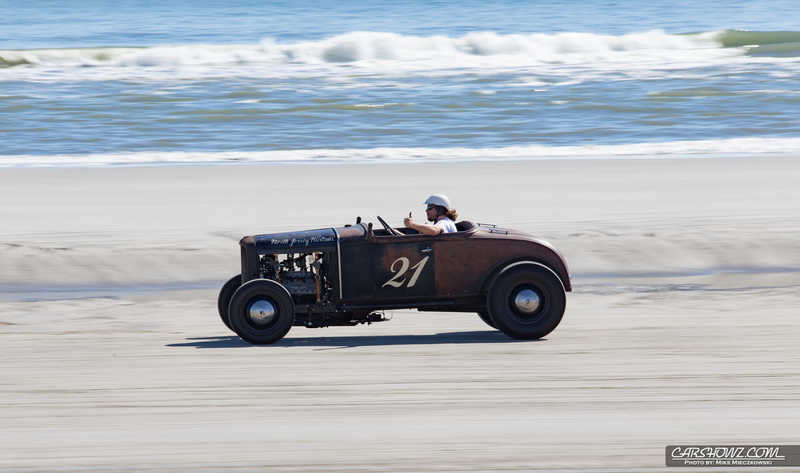 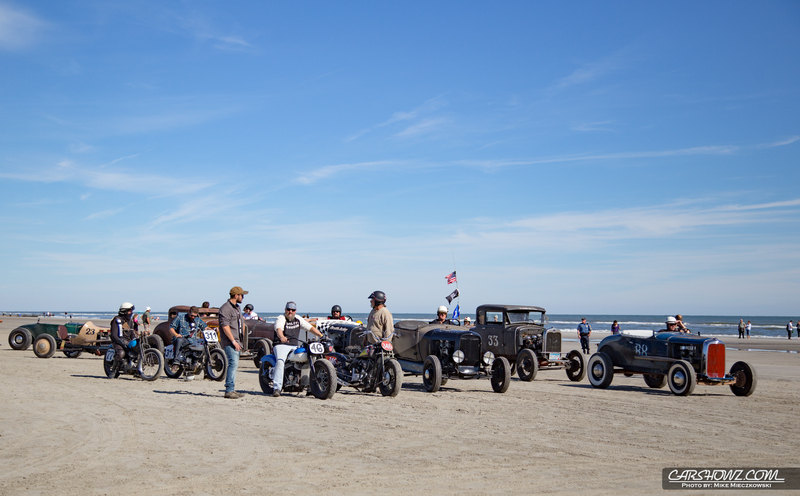 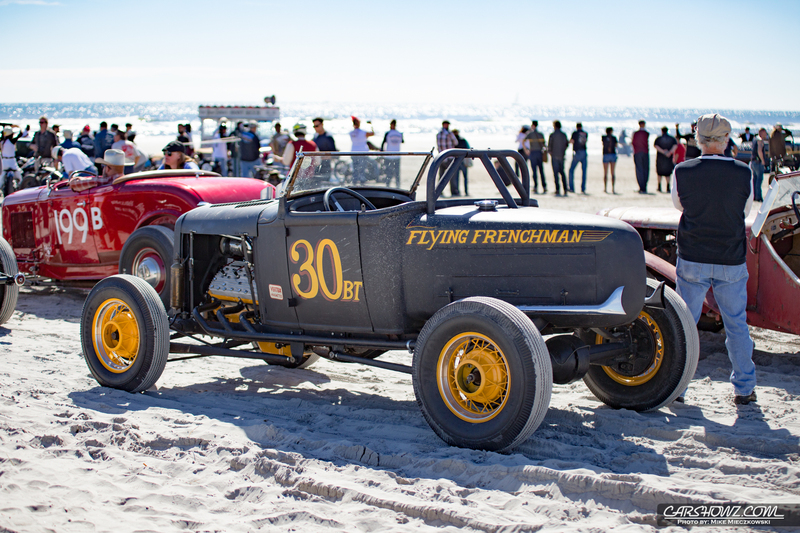 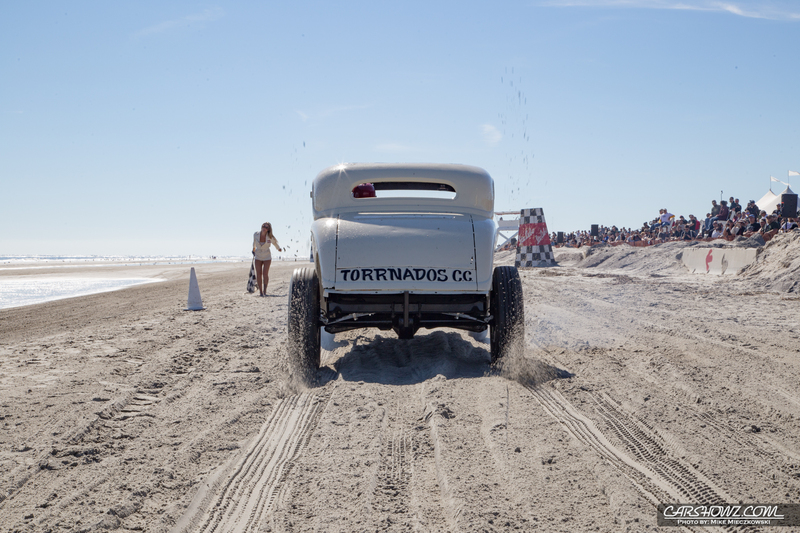 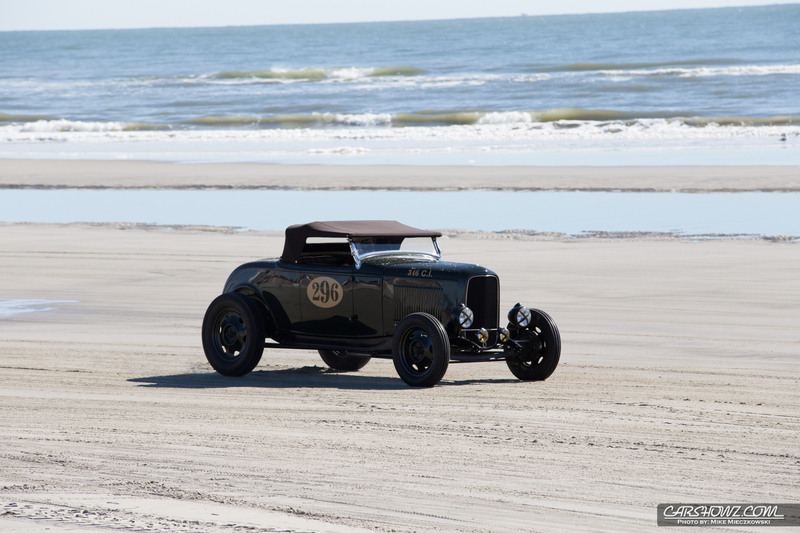 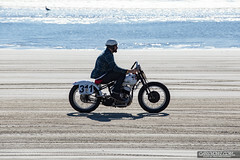 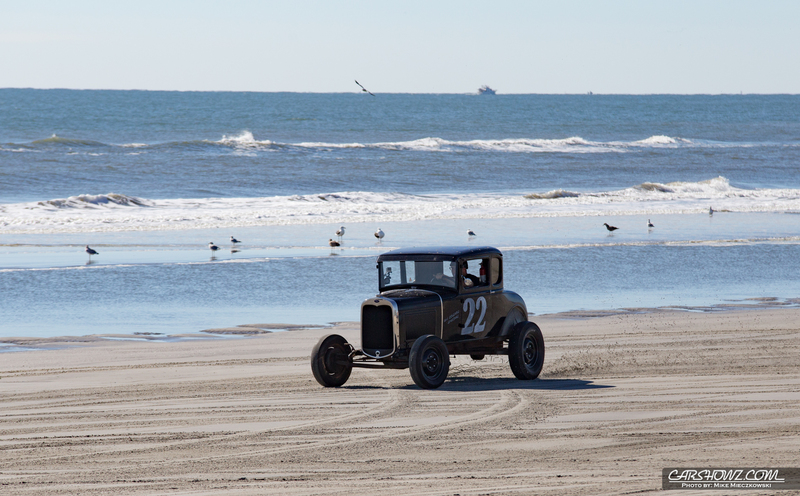 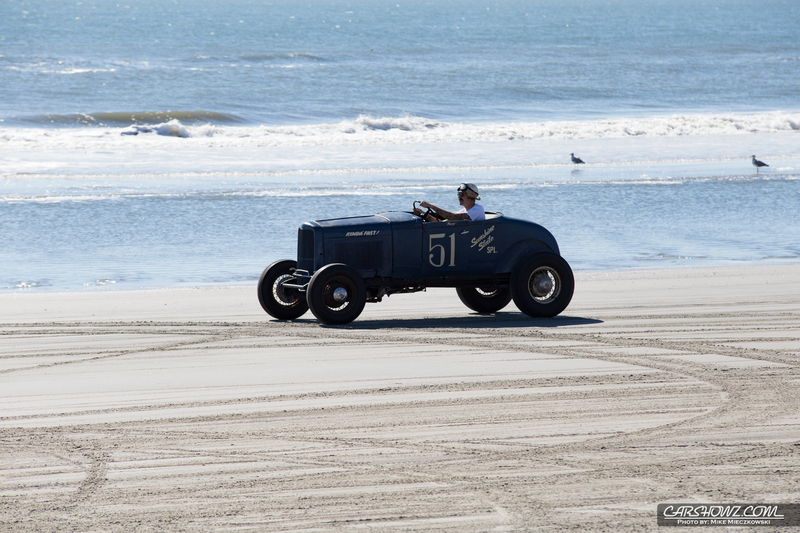 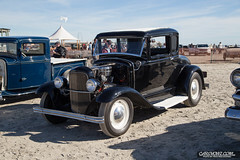 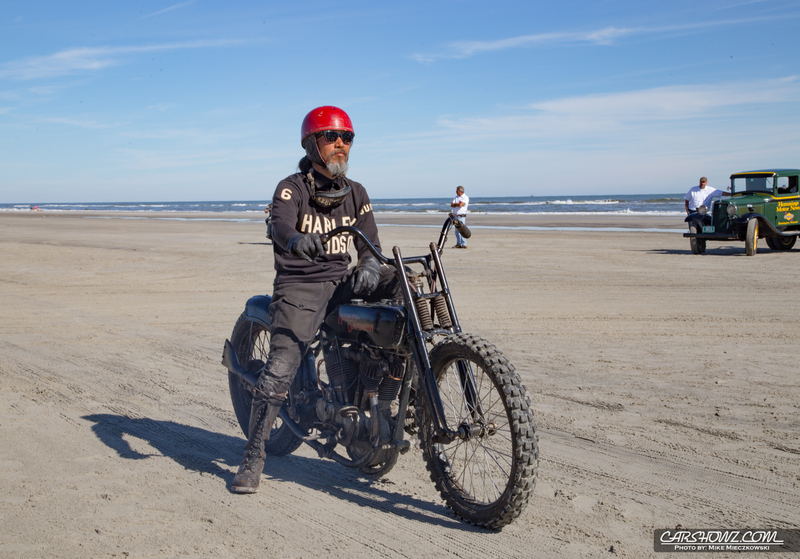 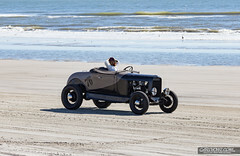 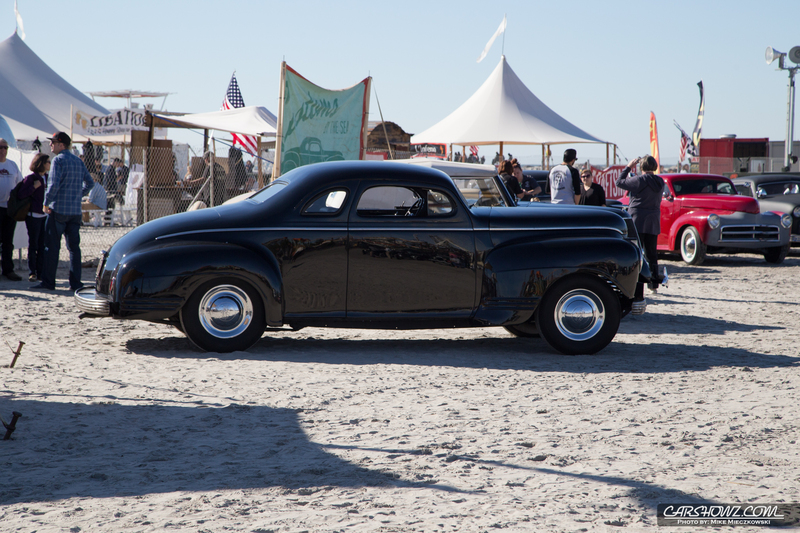 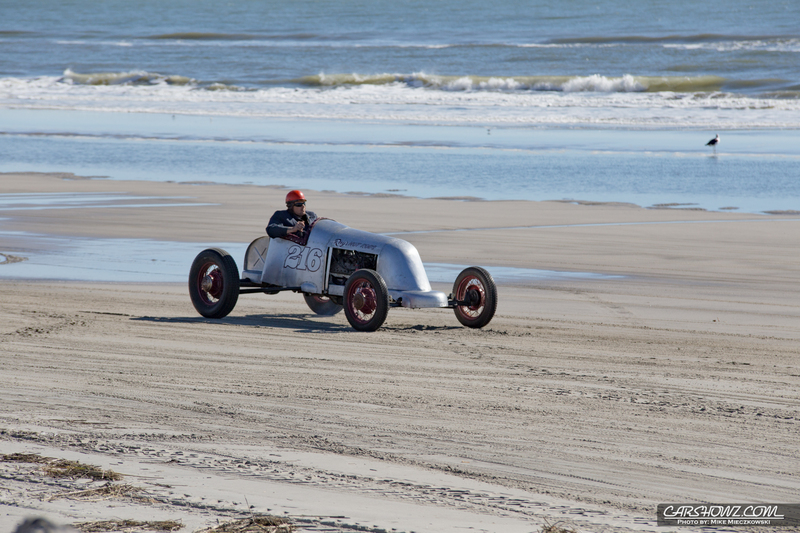 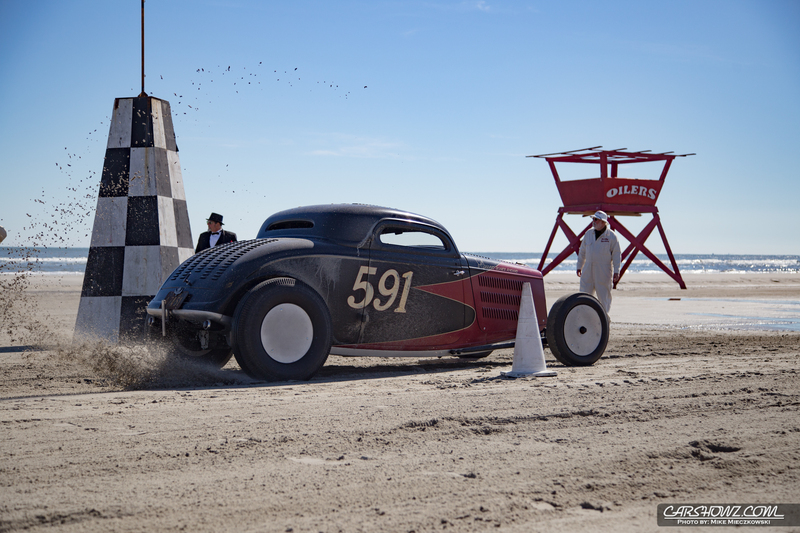 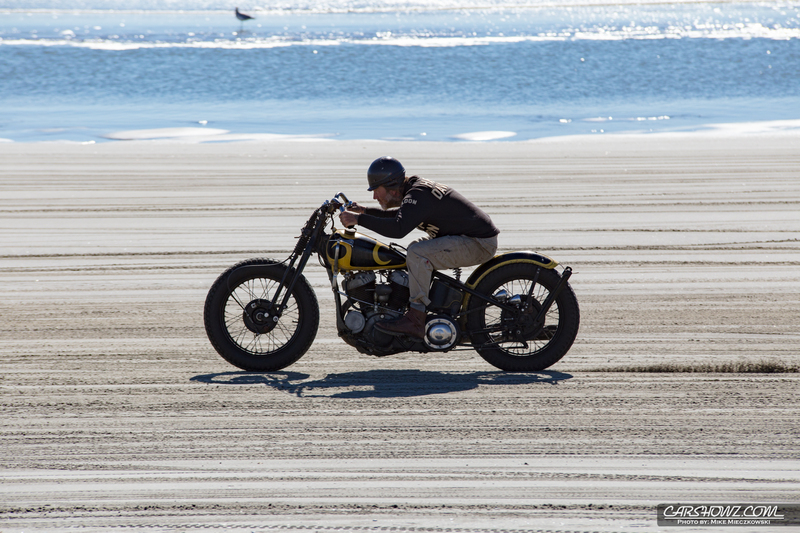 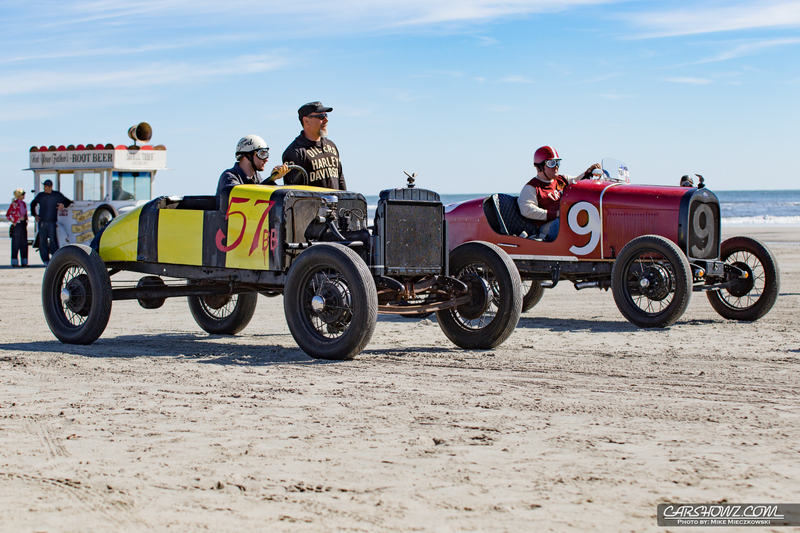 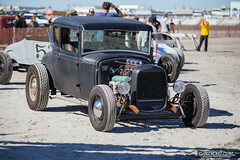 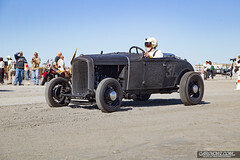 Since the Race of Gentlemen is held in October you never know what the weather will be like on the beach in Wildwood, NJ. 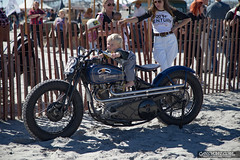 This year is a good example of that. 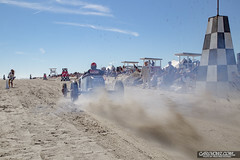 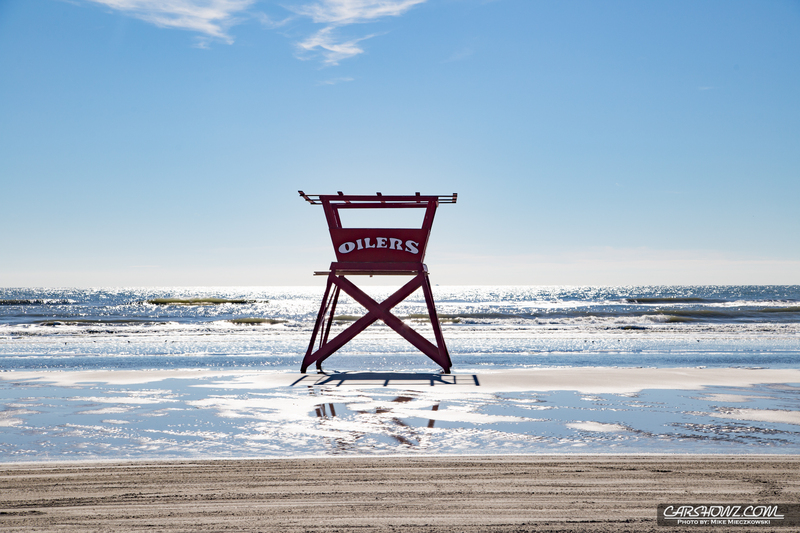 Strong winds, rain and beach eroding tides for the event to the following weekend. 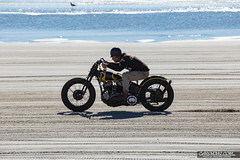 The morning was a bit chilly the day I attended (Sunday) but quickly warmed up for a sunny afternoon. 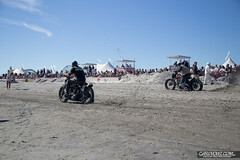 With nice weather comes good sized crowds and this was no exception. 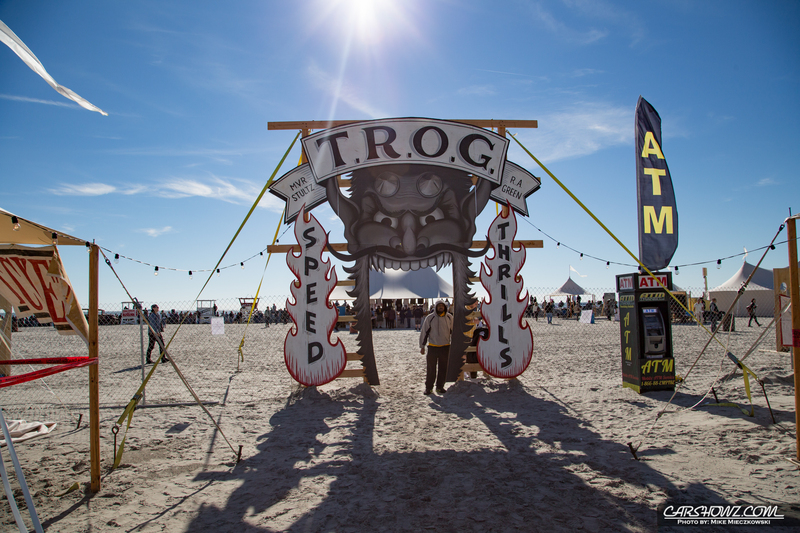 The weekend starts Friday night with a gathering known as the “Night of the Troglodytes”. 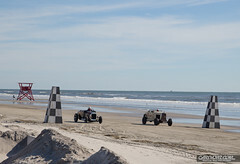 Saturday the racing kicked off early and went into the early evening hours. 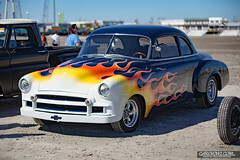 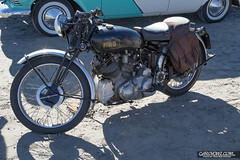 The rules are pretty simple, cars must be American made and pre 1953 and the motorcycles must be pre 1947. 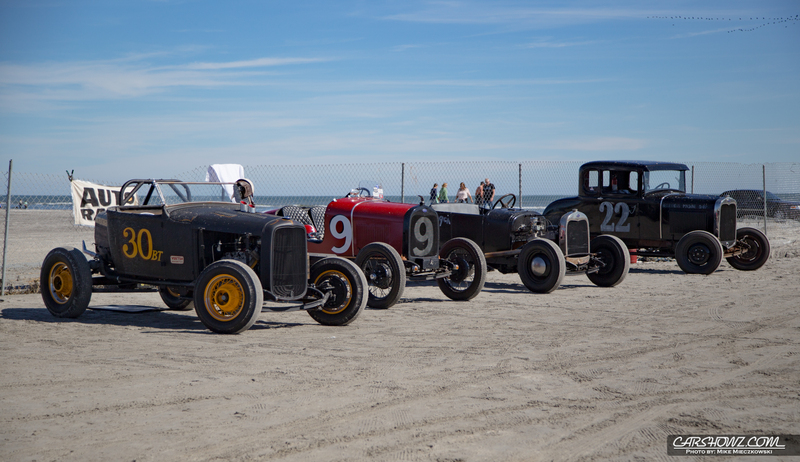 Most were much older. 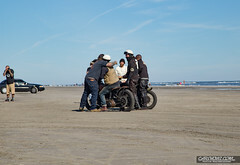 That was followed by the Bonfire party on the beach. 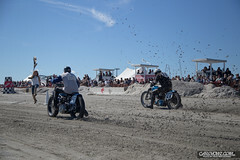 Sunday the sounds of cars and bikes racing started early like Saturday and ended sometime near mid to late afternoon. 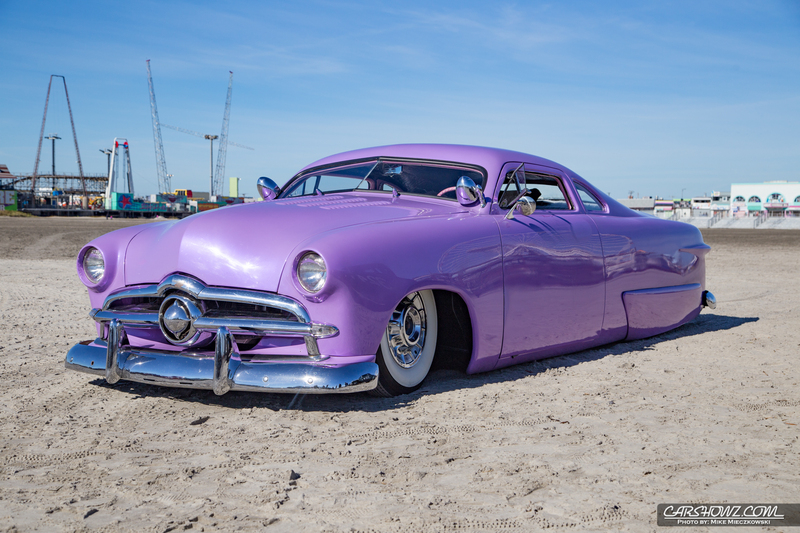 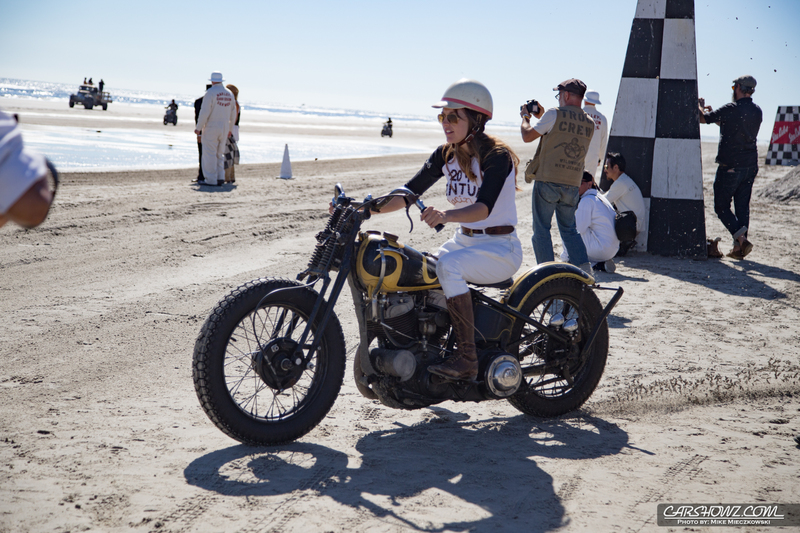 All weekend long you could find beautiful Pin Up Ladies walking the beach occasionally stopping to pose for the spectators and races alike. 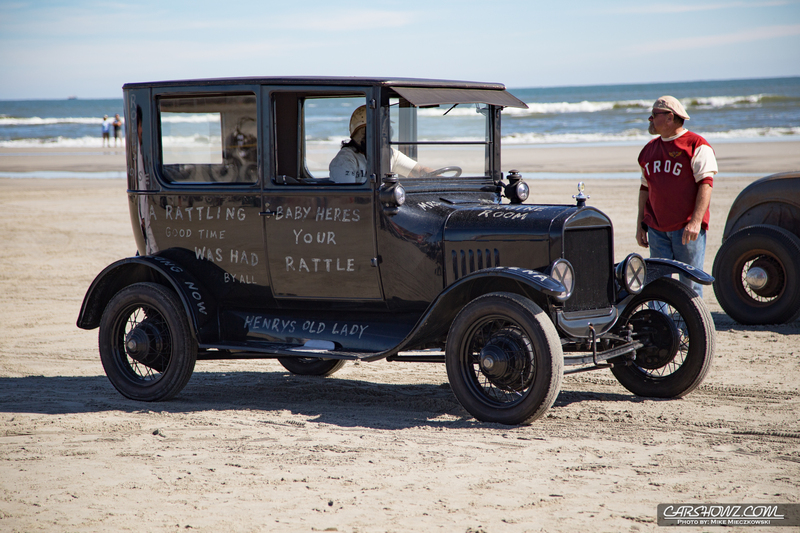 Libations could be found in the form of Not Your Father’s Root Beer and Pabst Blue Ribbon. 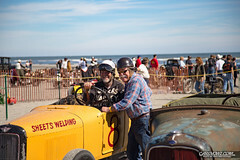 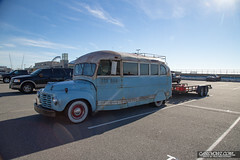 Hemmings Motor News, Harley Davidson Motor Co. and Craftsman were also in attendance as event sponsors. 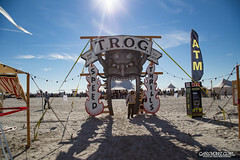 For the hungry folks there were vendors on site with the standard show fare or you could make the long walk from waters edge to be Boardwalk for any number or tasty treats. 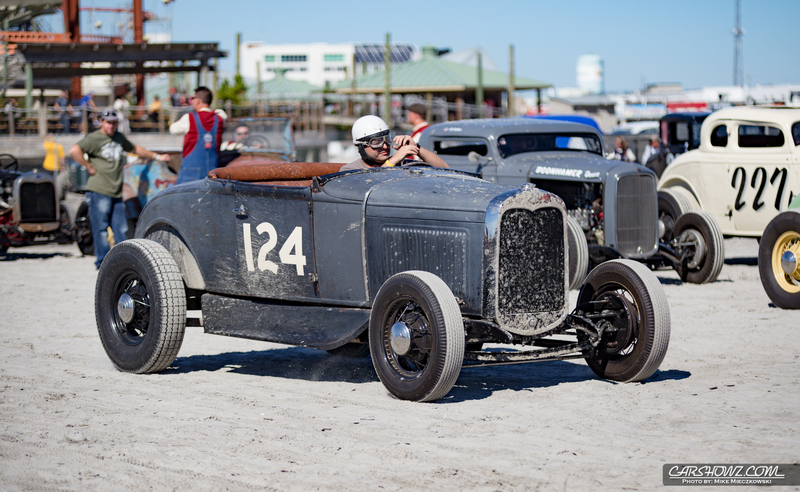 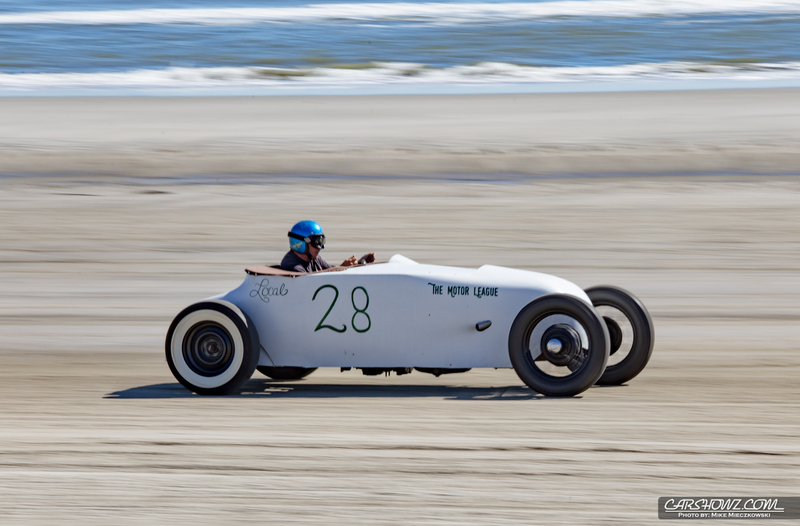 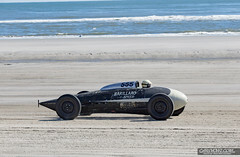 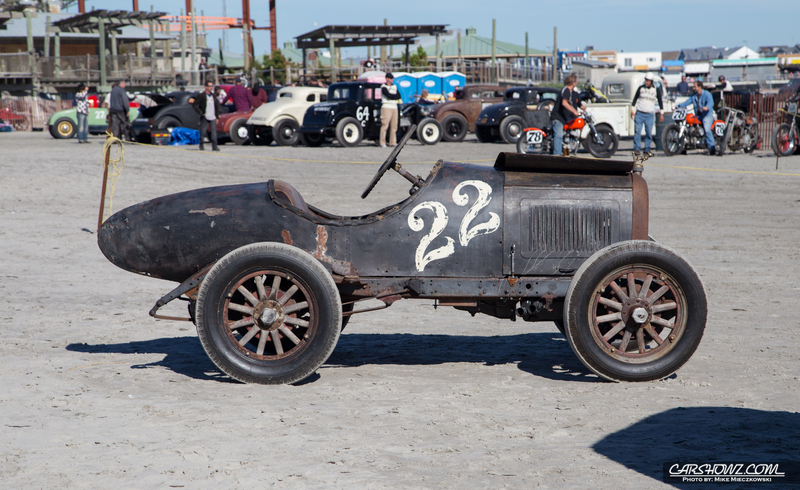 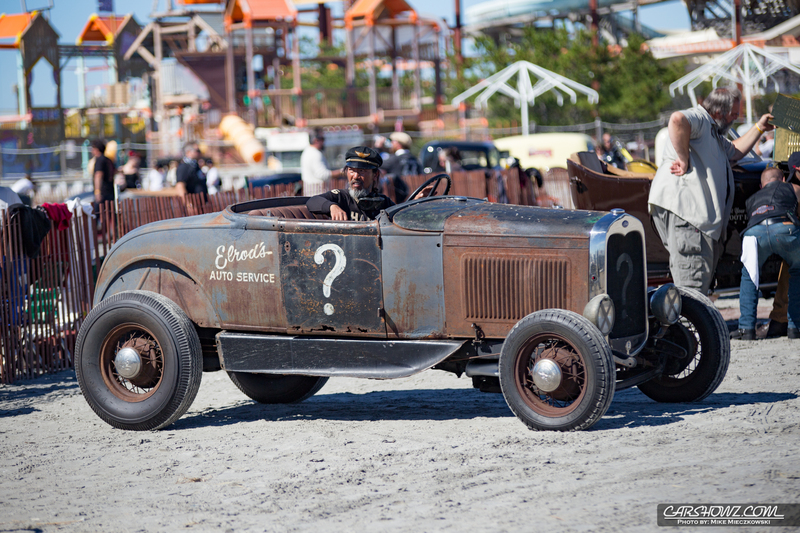 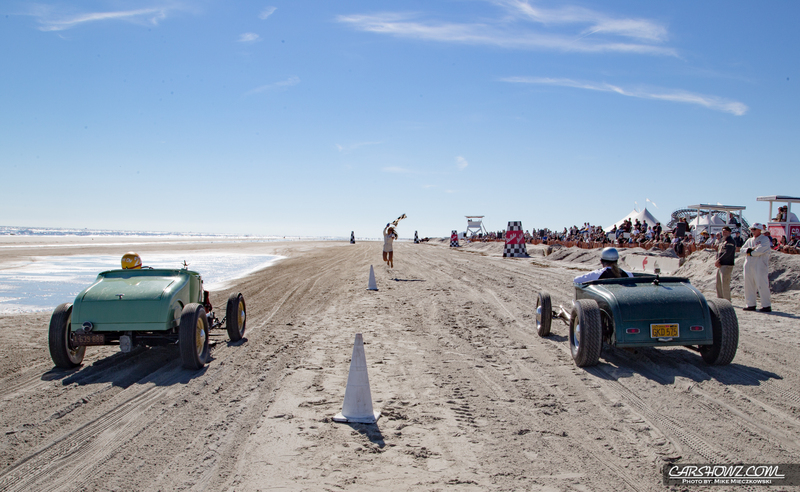 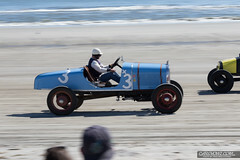 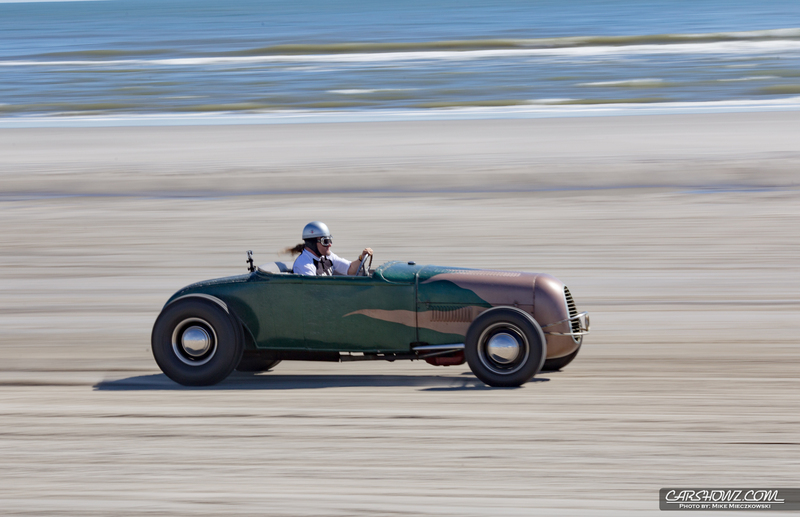 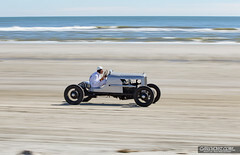 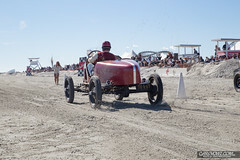 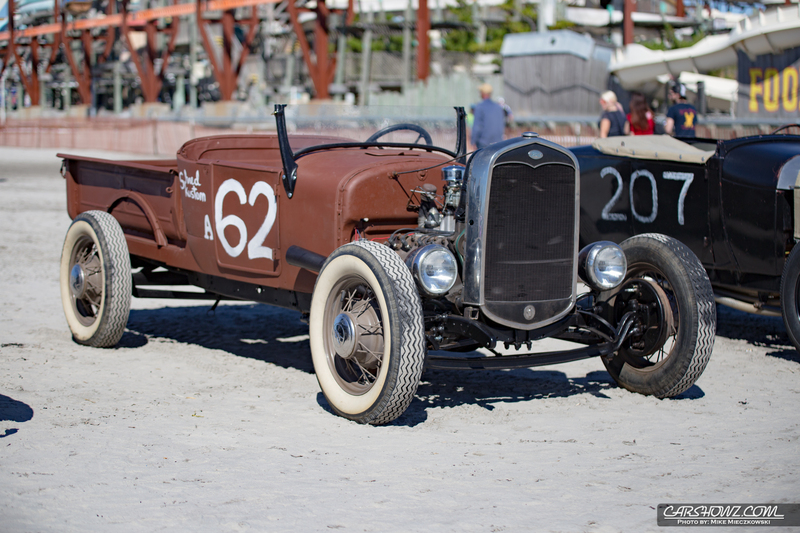 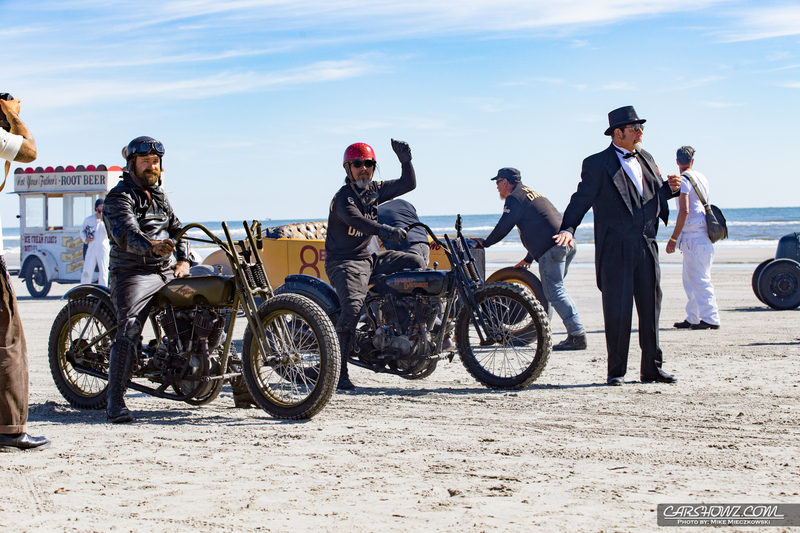 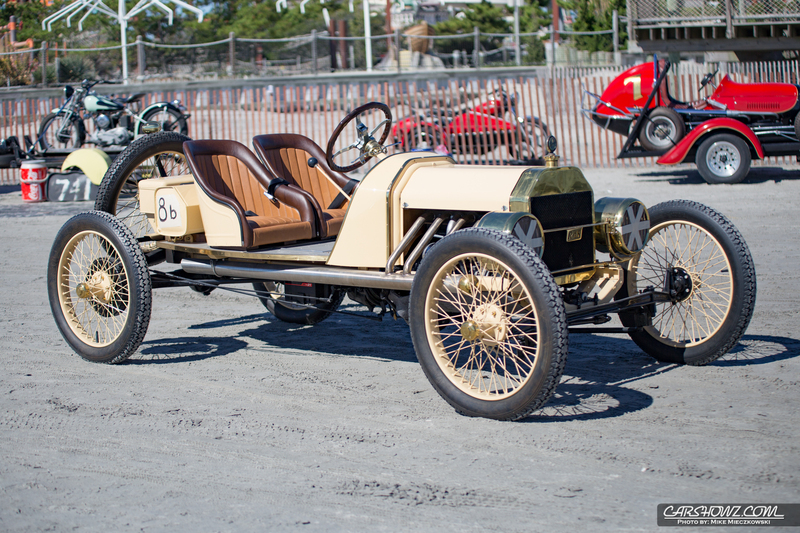 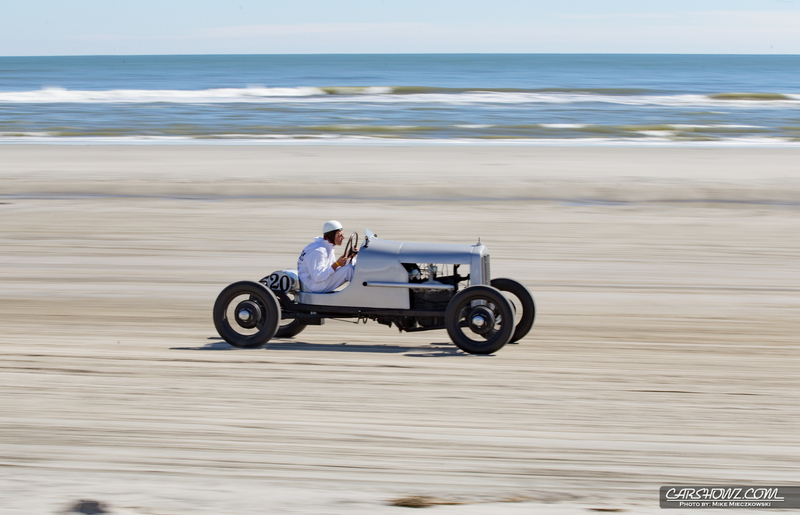 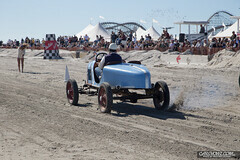 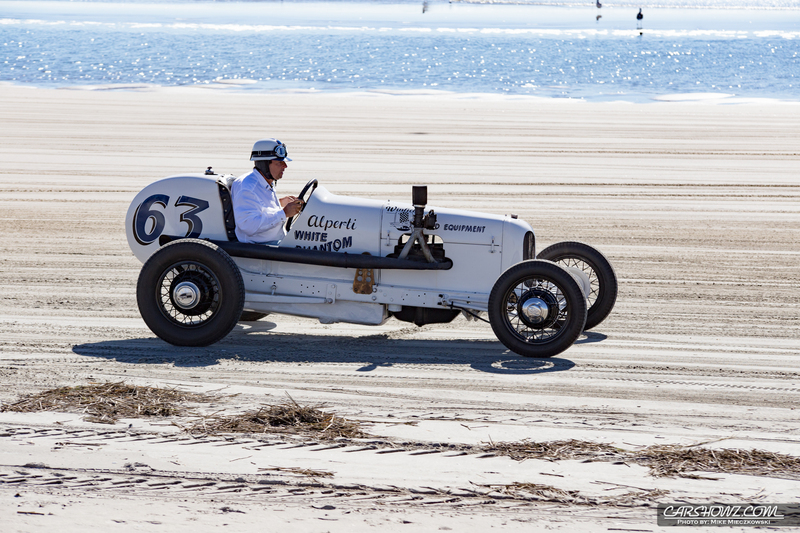 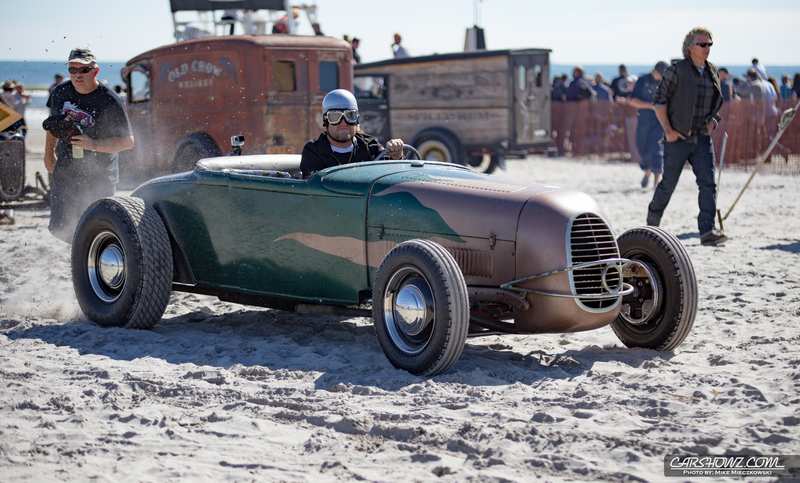 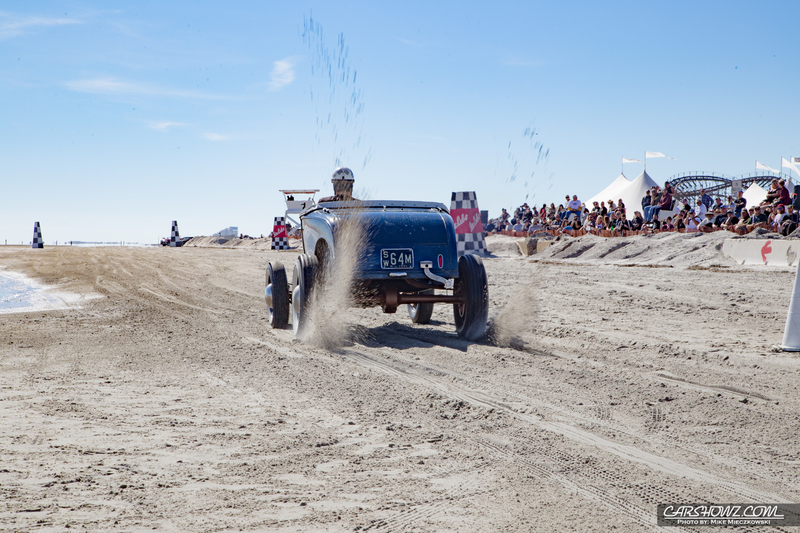 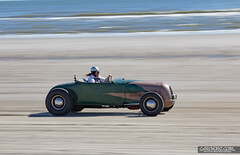 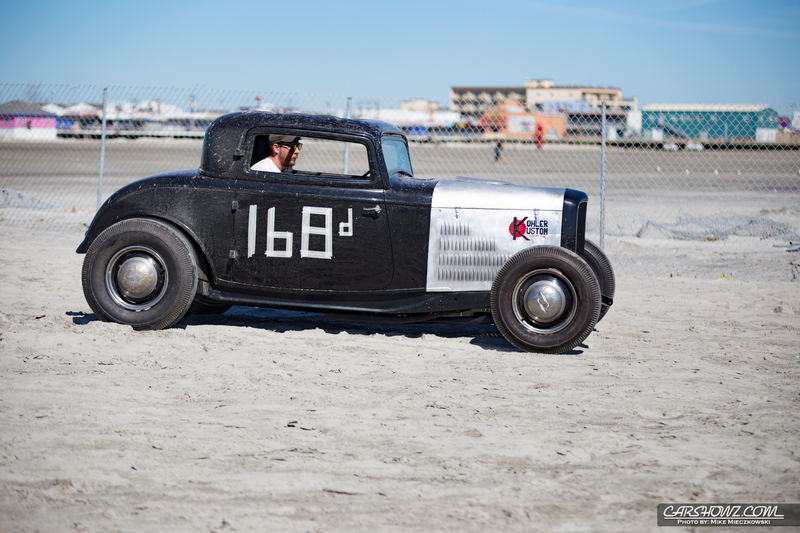 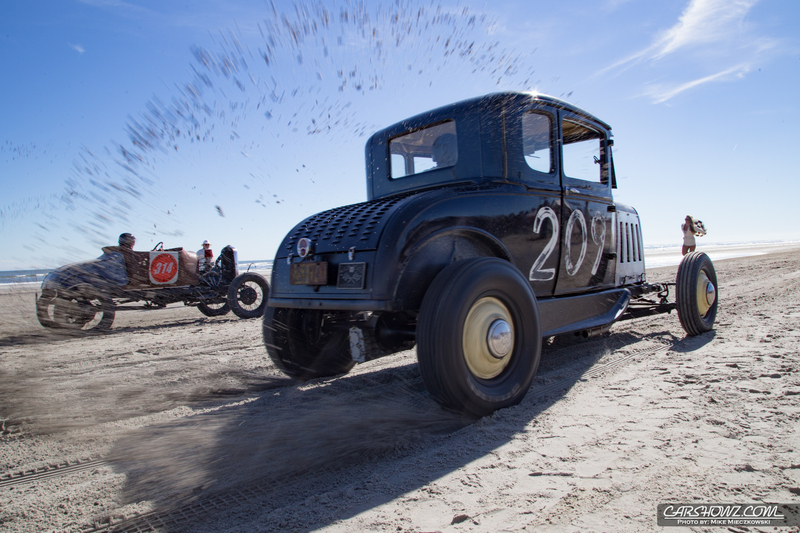 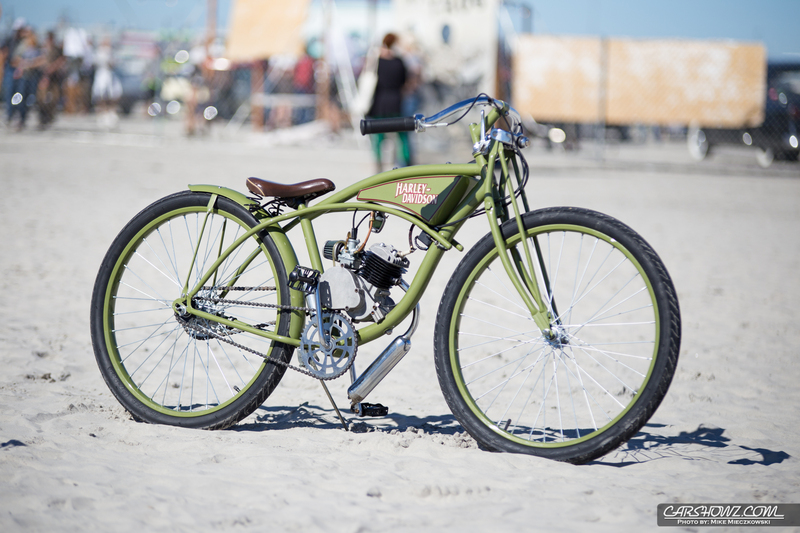 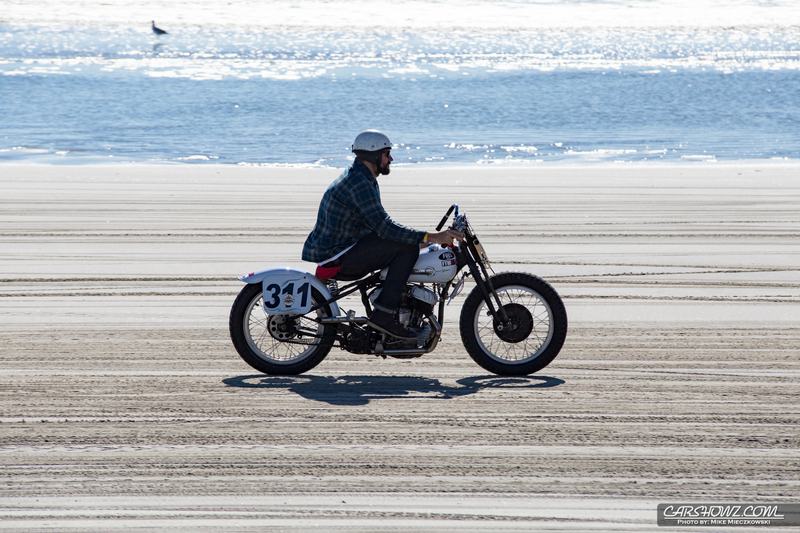 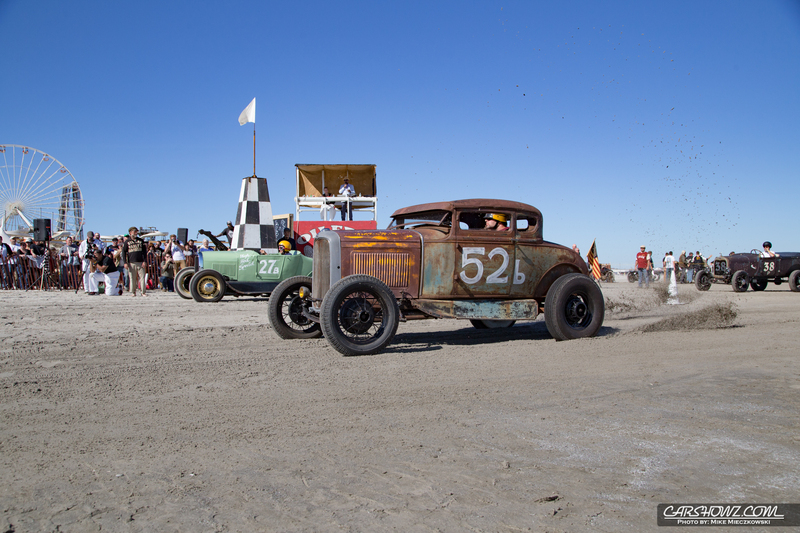 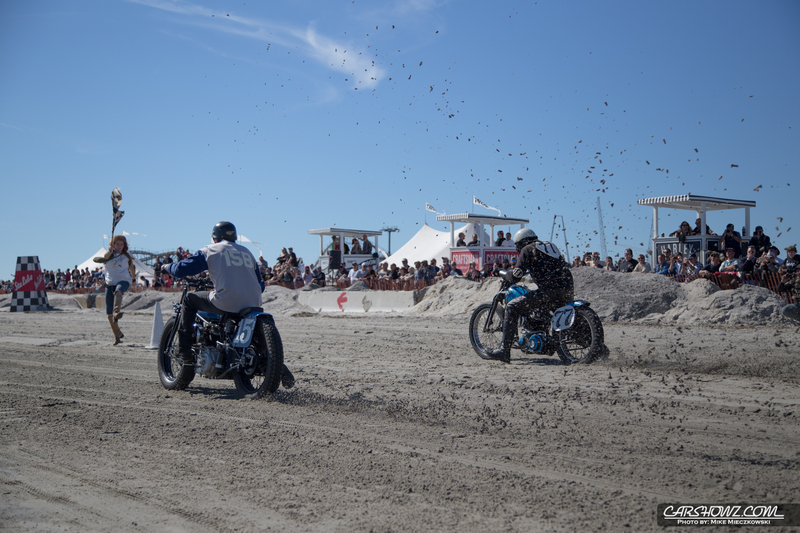 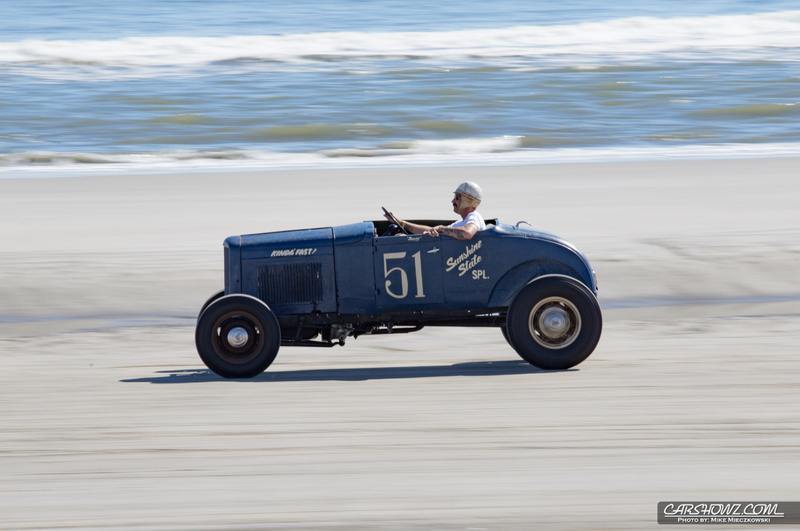 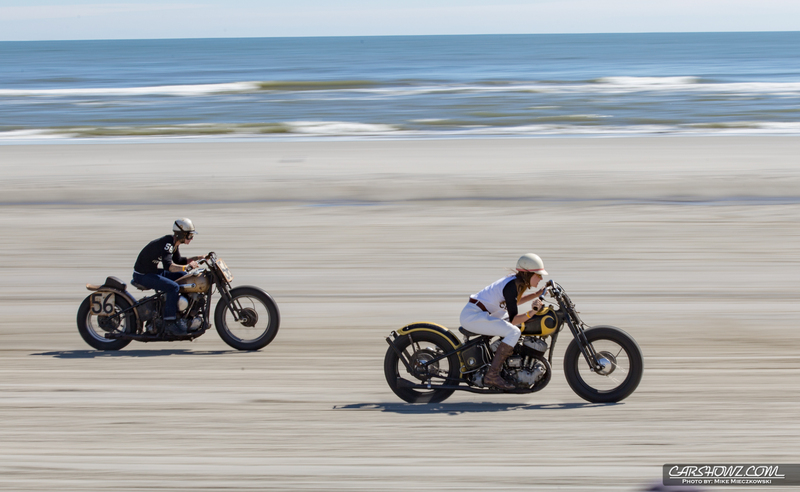 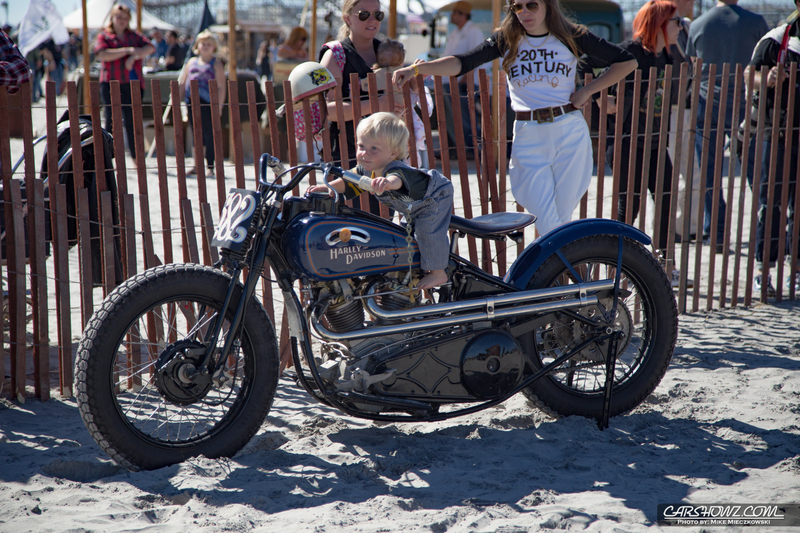 The Race of Gentlemen has drawn in people from around the Nation and around the world. 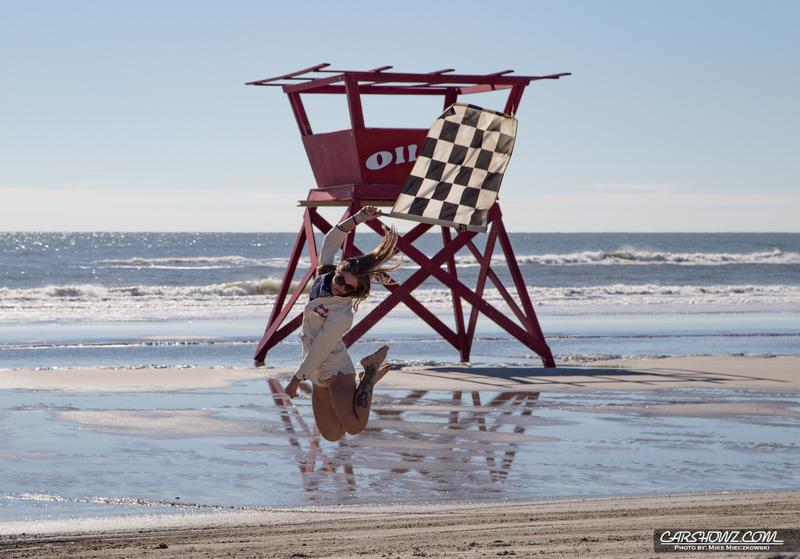 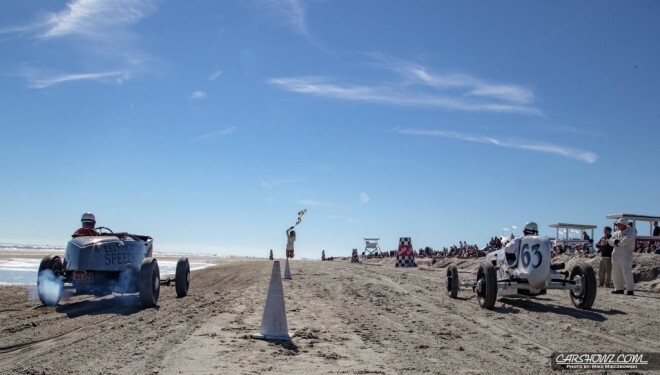 This year Wayne Carini from F40 Motorsports was out on the sand getting in a few races as well as the ever so beautiful and talented Jessi Combs. 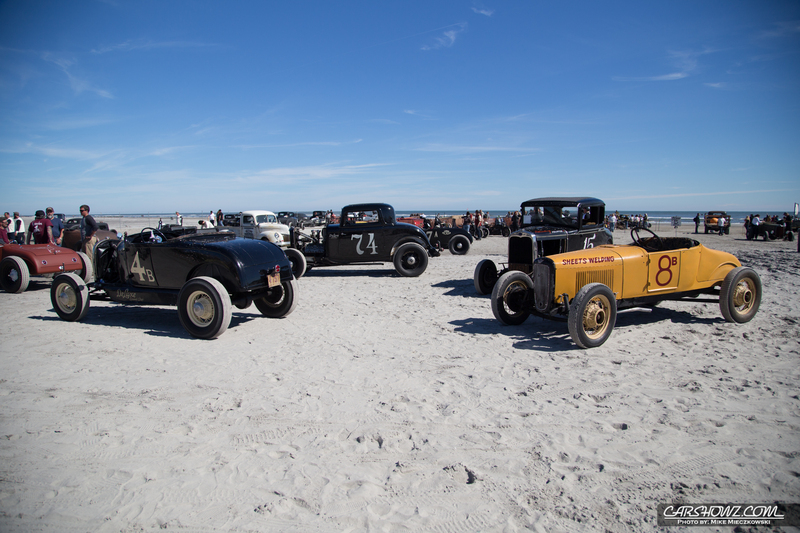 It is definitely a cool experience to be standing next to someone from New jersey one moment and a family from Japan or Norway then next. 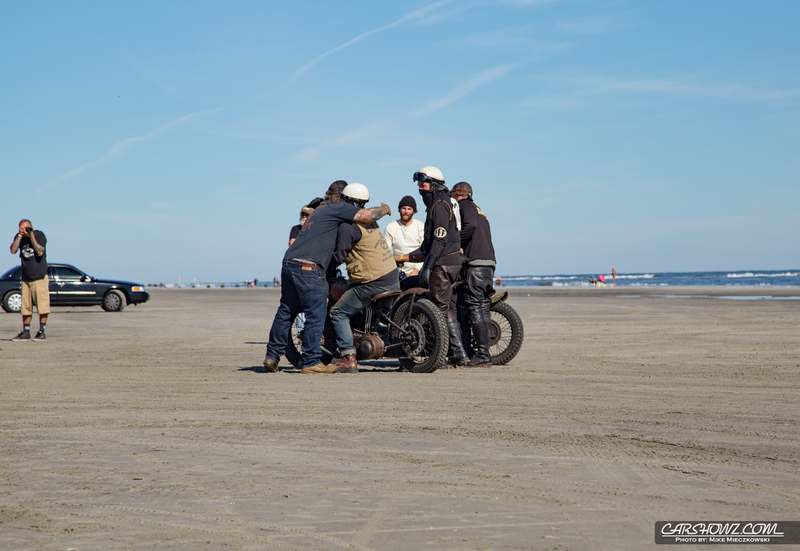 Everyone there for the same reason. 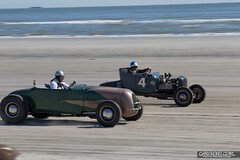 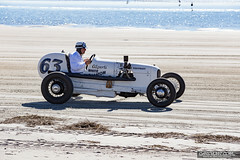 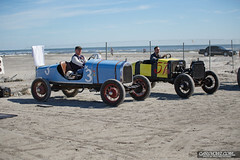 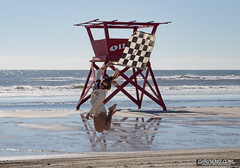 Races like this are not something available in most countries so visitors to the Wildwood Boardwalk took advantage of their opportune timing for a vacation.